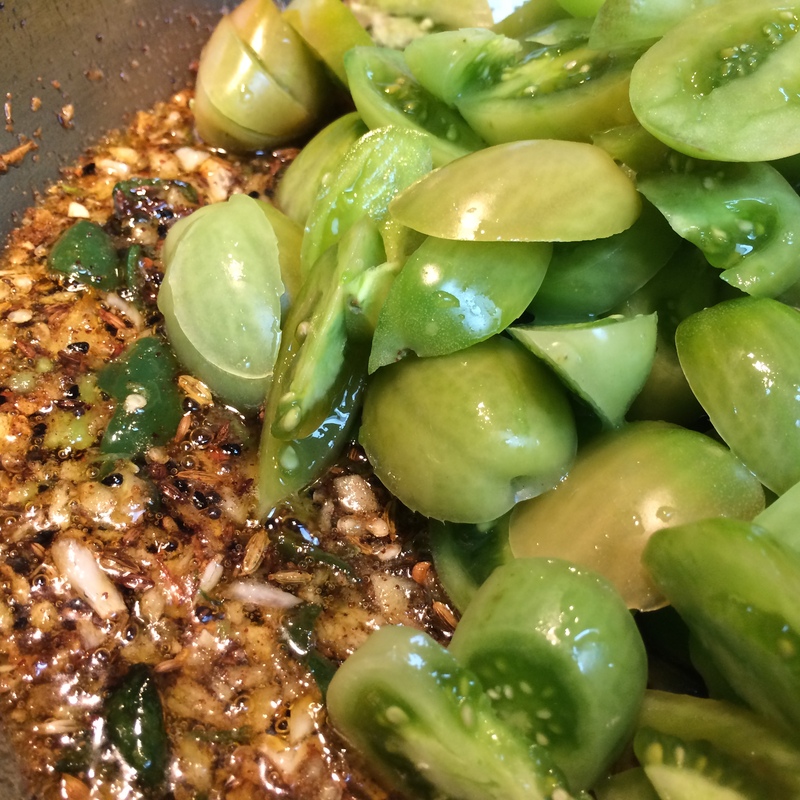 Two things that I’m having a lot of fun discovering — one is Burmese cuisine with its fishy umami and floral flavors . The other is the leaves of the bitter melon. I can’t decide which to be more excited about; but when you combine them? An explosion of flavors! So let me tell you what I know about both. 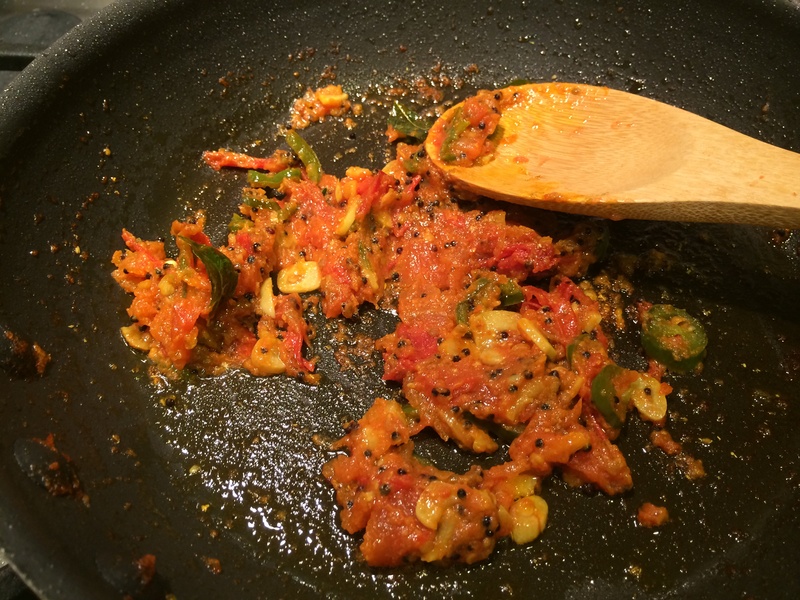 I have always loved the bitter melon (karela). This is a cousin of your garden-variety cucumbers and cantaloupes, but its seeds are large and hard, its skin is bumpy, and its flesh is scanty and bitter. Certainly for special tastes; but once your tongue has learned to love it, you really love it. But then, I recently discovered that its leaves are edible too. 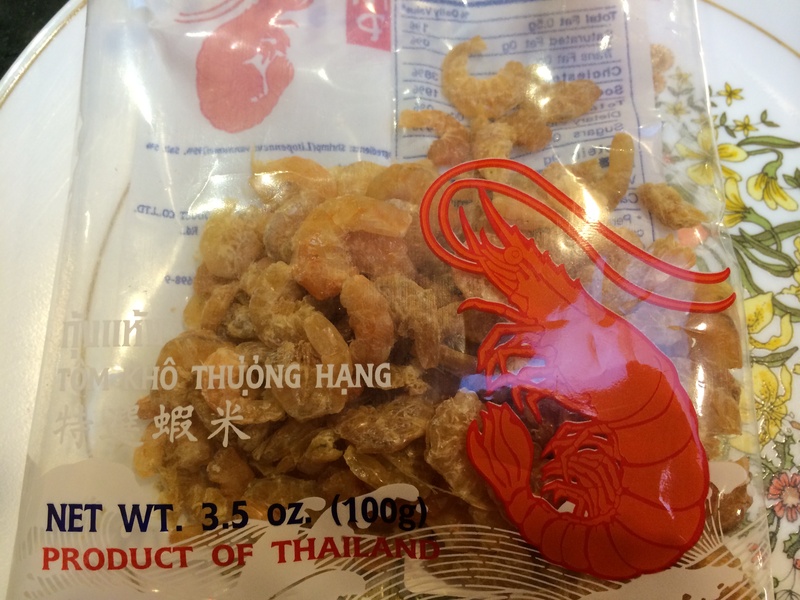 One finds them at the farmer’s markets in San Francisco that serve an ethnic clientele. They are sold in giant bunches for a dollar. I leave with my wallet almost intact, and my shopping bag full to bursting with greens, the tendrils spilling over the top. 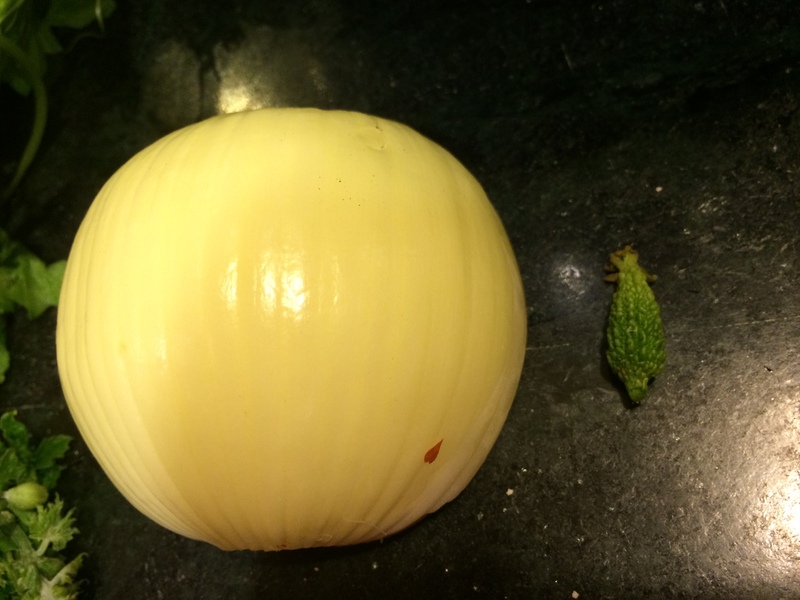 One of the most enchanting things about buying a bunch of bitter melon greens is the baby gourds one finds attached to some shoots. Normally the gourds are at least six inches long, but with every purchase you also get some baby gourds, some no bigger than your finger tip. 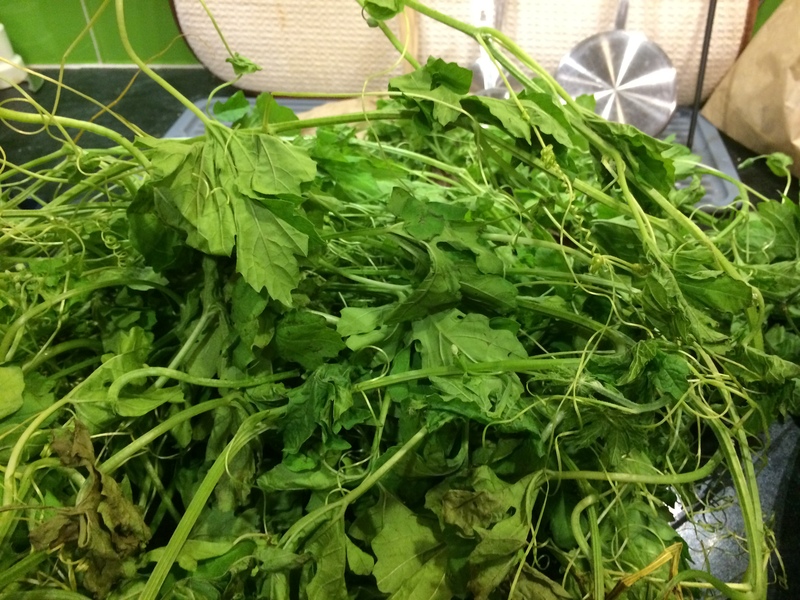 These can be thrown into the pot along with the greens, they do not need much cooking. Those of you who want to like dandelion leaves, but find that they are just a little too bitter to enjoy, might love the bitter melon leaves. They only have to be cooked long enough to wilt, and have a complex, grassy bitter-tinged flavor. Now about Burmese cuisine. I admit I don’t know much about it but I’m starting to learn. 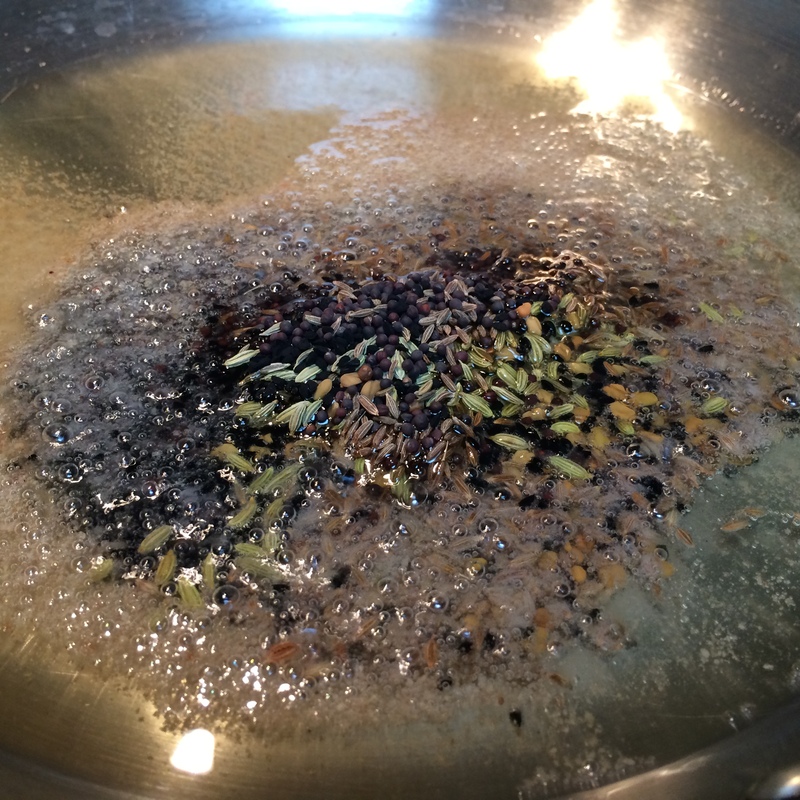 I recently got a Burmese recipe book; but rather than make any recipe from it, I tried to understand the techniques and flavors and tried to imbue this particular broth with the Burmese gestalt. 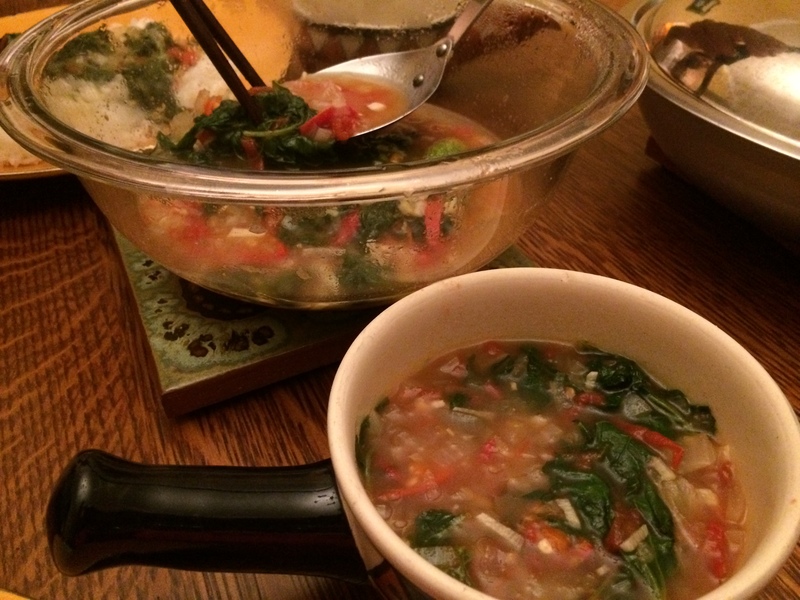 At the risk of causing derisive laughter among any Burmese readers, I made what I like to think of as a Burmese broth. 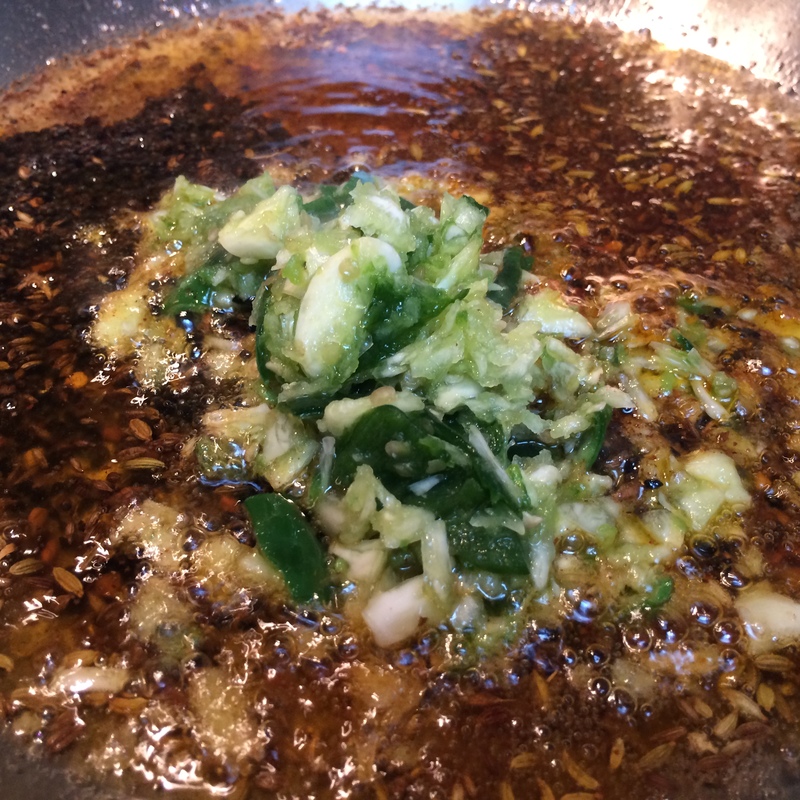 Unlike Indian food, it only gently cooks onions; it uses lemongrass infusion; and it uses fish sauce instead of the more Chinese soy. We loved it with some white rice. please let me know in comments if you did too. 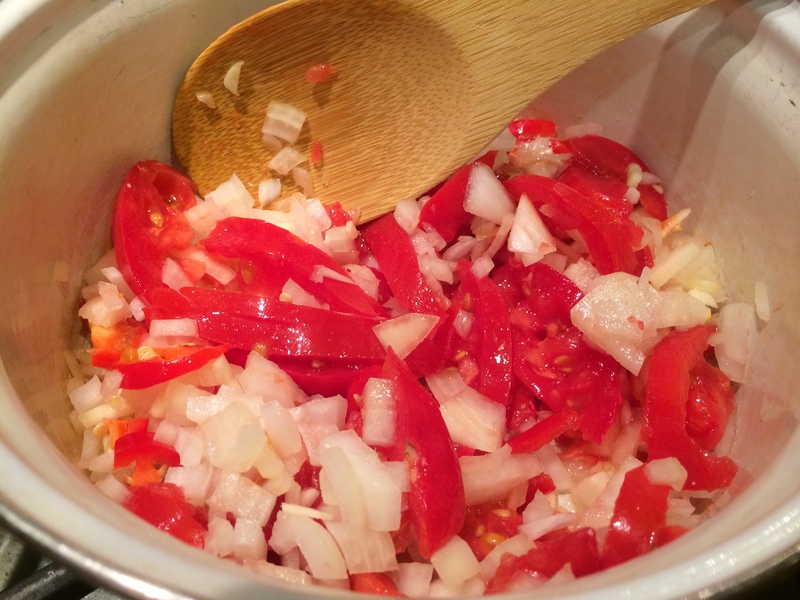 Put oil, onions, tomatoes, garlic and chili all together in a thick-bottomed pot and cook gently until softened (about ten minutes). 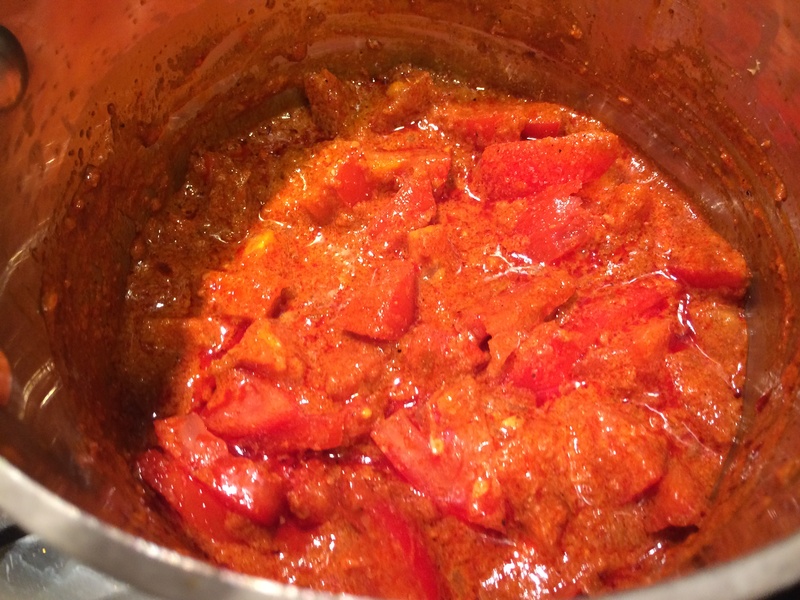 The tomatoes should have liquefied and somewhat dried by now, if not cook a few minutes longer. Now add the broth, the fish sauce, and the lemongrass. Bring to a boil and simmer for ten minutes or so. Add the greens, and allow them to wilt. Turn off the heat. 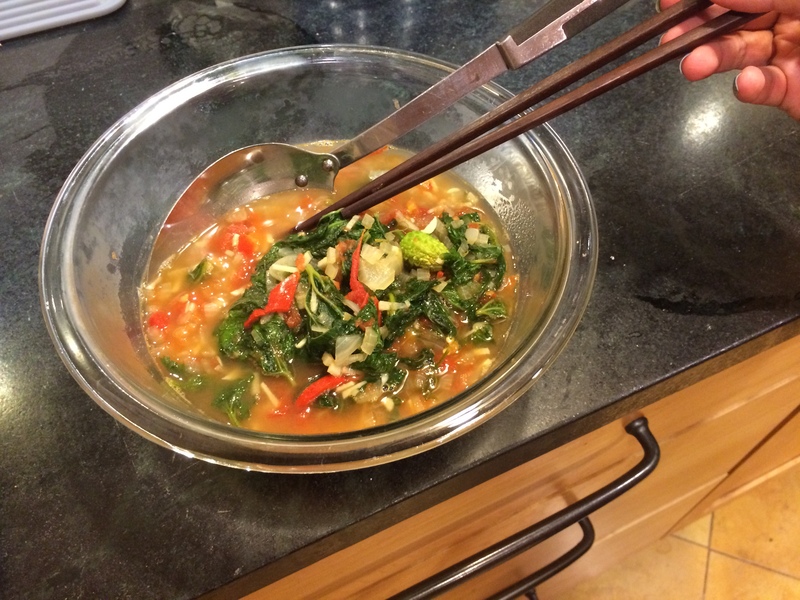 Serve in soup bowls, with soup spoons and chopsticks for lifting the greens, and some white rice on the side. I met a lady from Louisiana over Thanksgiving at my in-laws’ place. Of course, I asked her about gumbo, it being the only thing I know about Louisiana, other than that Louisianians are sometimes inclined to place their banjos on their knees. Well, I’m glad I asked. In her lovely Louisiana accent, she related the story of a dish amalgamated from three different cultures, that has become one of the touchpoints of Cajun people. One browns the flour in grease for hours and hours, constantly stirring, she told me in a faintly challenging tone of voice; of course this made me want to try making it right away. What is gumbo? People often call it a soup, but from what I can tell it is more of a stew, and eaten with rice. Sometimes seafood is cooked in it, other times meat — never both. But I’m not a huge fan of meat, and the hubby doesn’t much care for seafood. 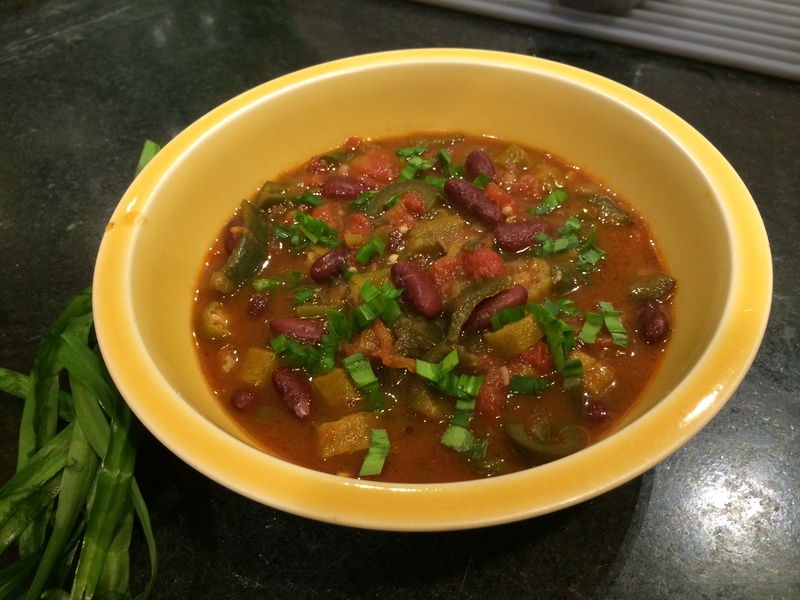 Lucky for us, there is a long tradition of vegetarian gumbos as well, either from the rustic cuisine of people who could not afford meat, or the six-week period of Lent when meat is to be abstained from. The most interesting thing about gumbo is that each of the peoples that has lived around the Gulf has left their mark on it. The Choctaw people have lived around there since the days of the mastodon, which they hunted. If that sounds rather prehistoric, well, it technically is — the mastodon became extinct 12,000 years ago. 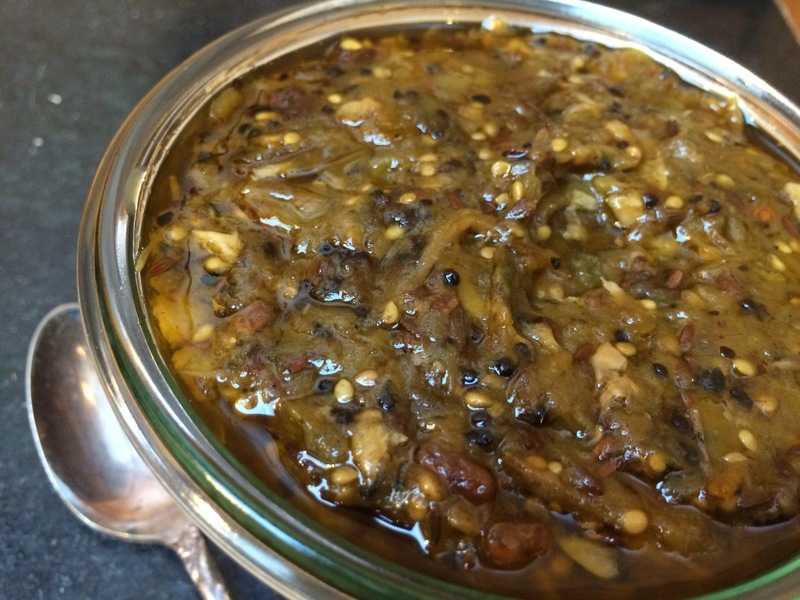 The Choctaw were intimately familiar with the native plant and animal life around their region; one of the things they contributed to the gumbo is their use of sassafras leaves. This plant (the root of which is the one that gives ‘root beer’ its name) is distantly related to other aromatics such as bay leaf and cinnamon. 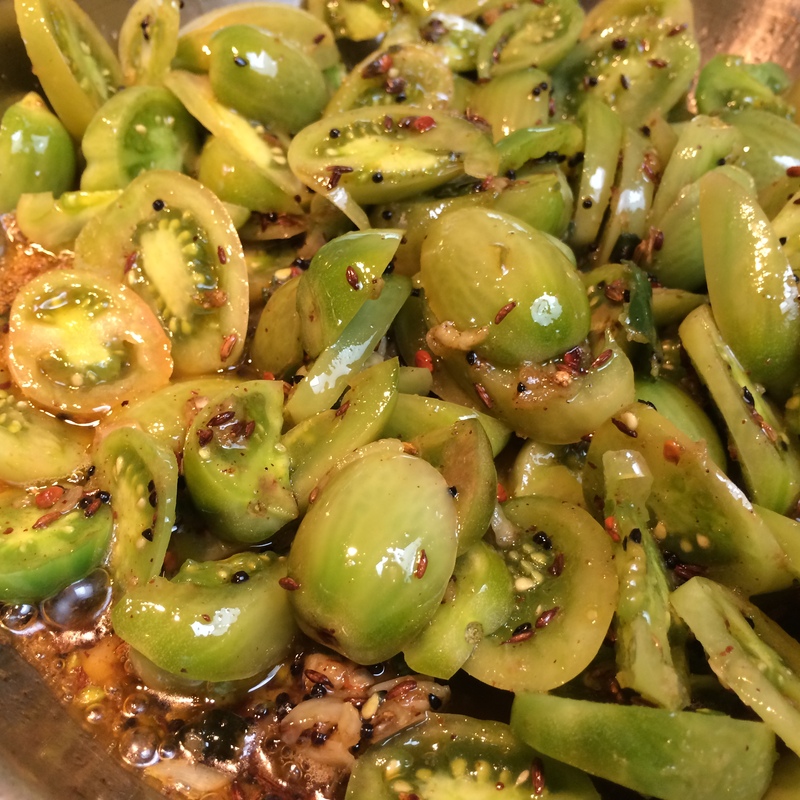 Sassafras leaves are ground up to make filé, which is used to flavor and thicken gumbo. Ten thousand years of sheer Choctaw-ism and then the Europeans show up. What concerns us here, through all the sturm und drang of the European settlement, is the effect it had on gumbo: the small population of French Canadians that were exiled here brought with them some notions of French cooking. 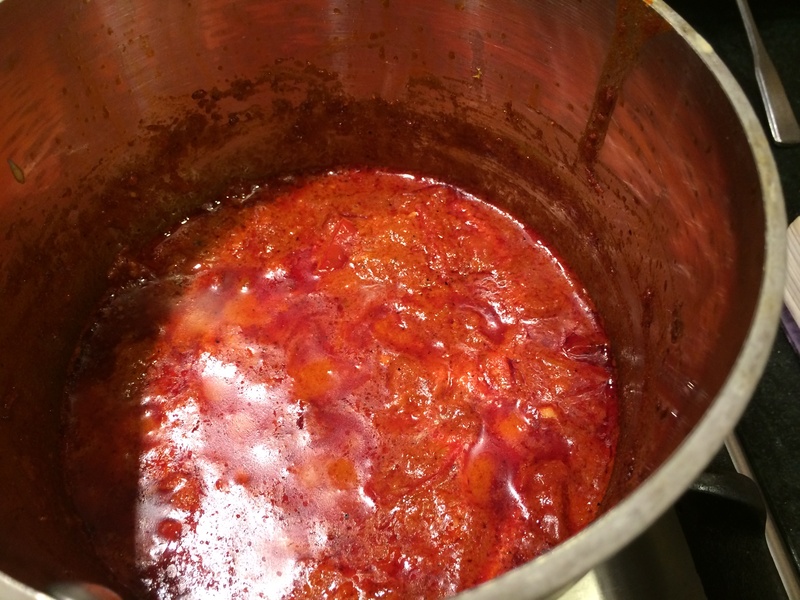 This includes roux — the cooking of flour in fat that many French sauces are based on. 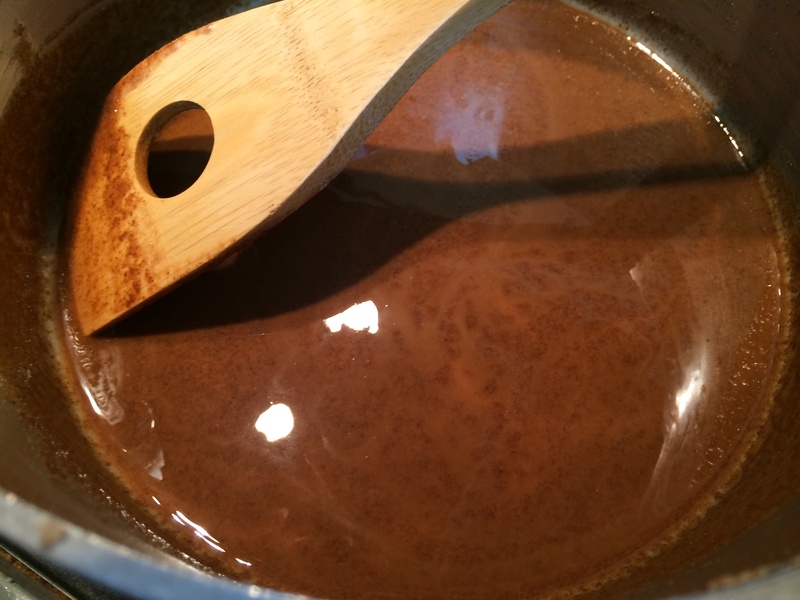 French cooking tends to use butter, but then the French roux seems to be mostly left pale; for gumbo the roux is cooked for hours till browned, and in that situation the butter would burn, so for gumbo, oils or lard are used instead. Interesting tidbit — the word ‘Cajun‘ is a corruption of the word ‘Acadian’ — Acadia, Canada being the place that the French Canadians were exiled from. 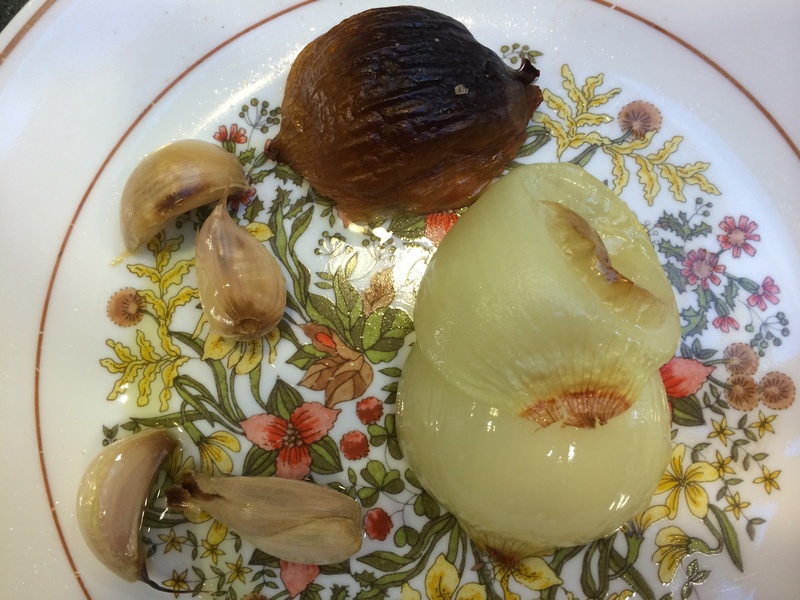 Cooking aromatics into the base of the stew is another common European method. 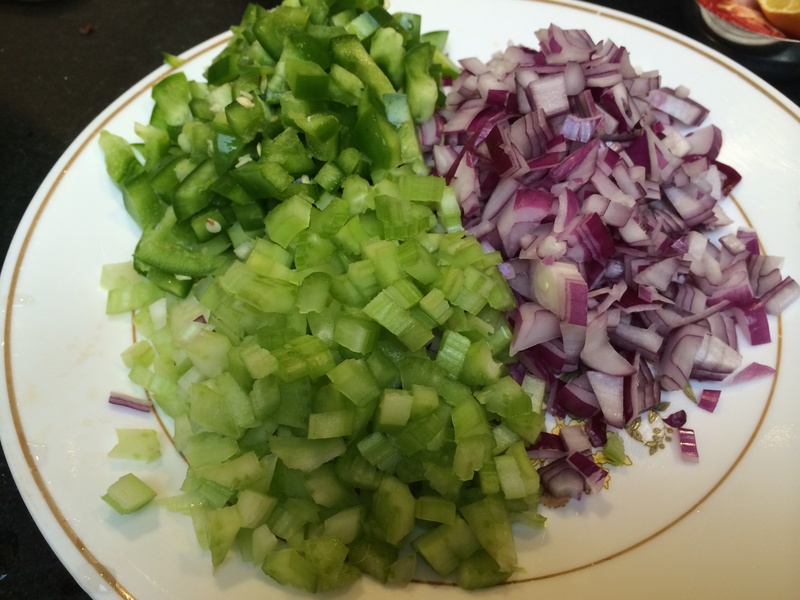 The French call it mirepoix and the Spanish call it sofrito. 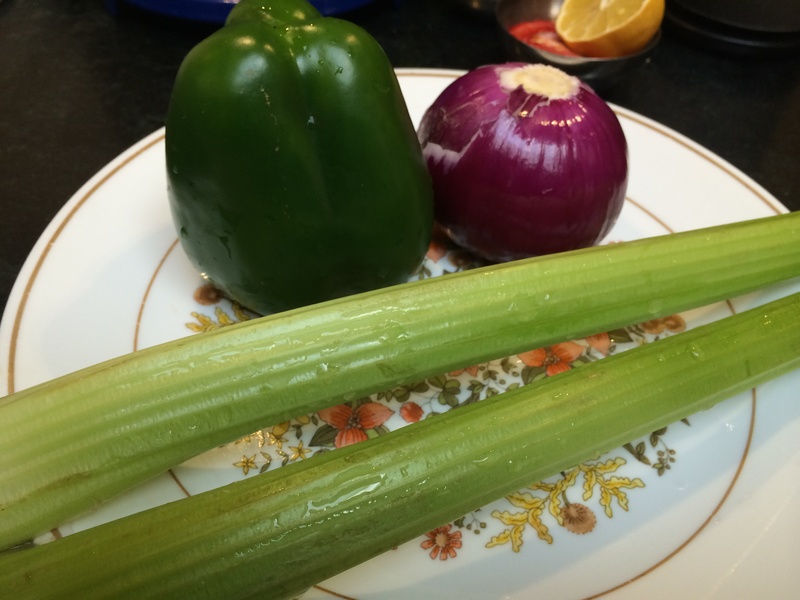 The standard set used in gumbo is called the holy trinity and is made up of equal amounts of onion, celery and green bell pepper (capsicum). This particular set clearly shows the Spanish influence on the region. Another set of cultural influences arrived with the Africans brought over through the slave trade. 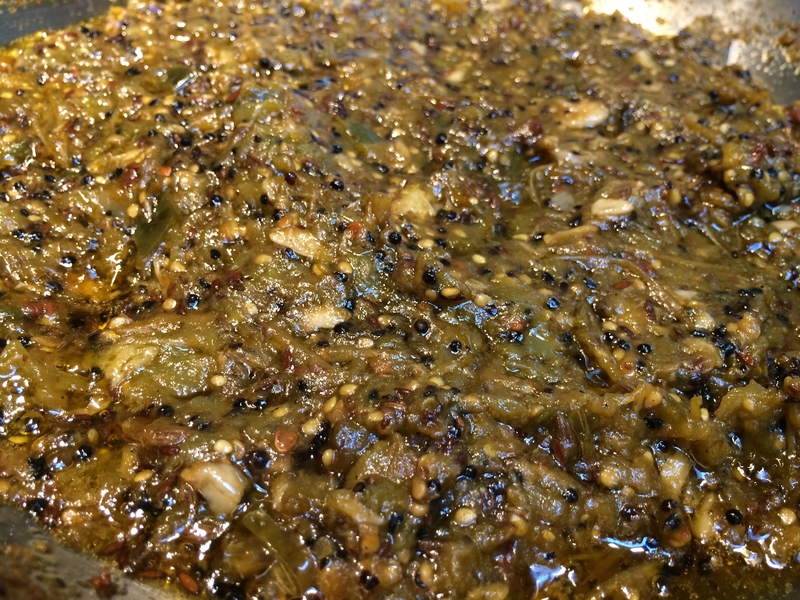 Now once again, many tears and blood have been spilled over this, but what concerns us for gumbo is that the Africans brought over a couple of my old friends to America — my slimy old pal the okra (bhindi) that I have loved since childhood, and rice. 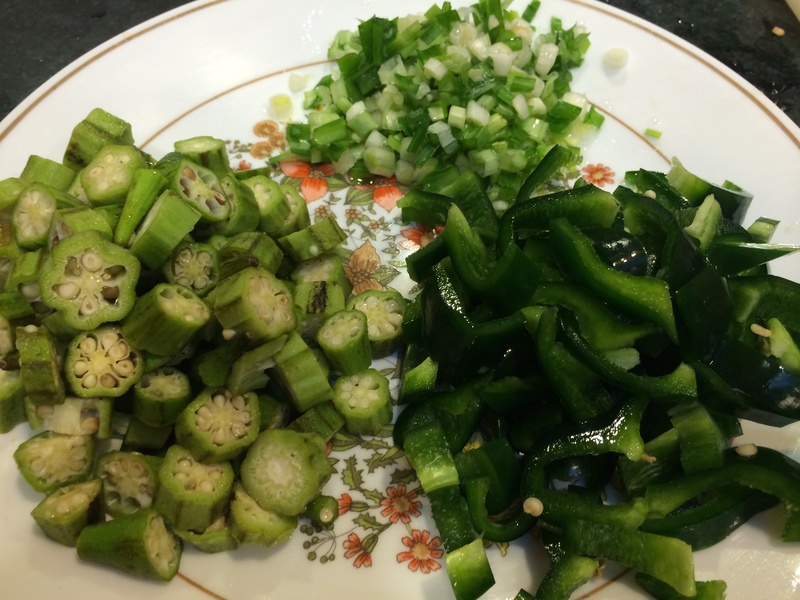 West African stews often cook down okra into it with onions and meat: the okra gives off its glutinous slime (I say that with love) to make the whole stew have integrity. 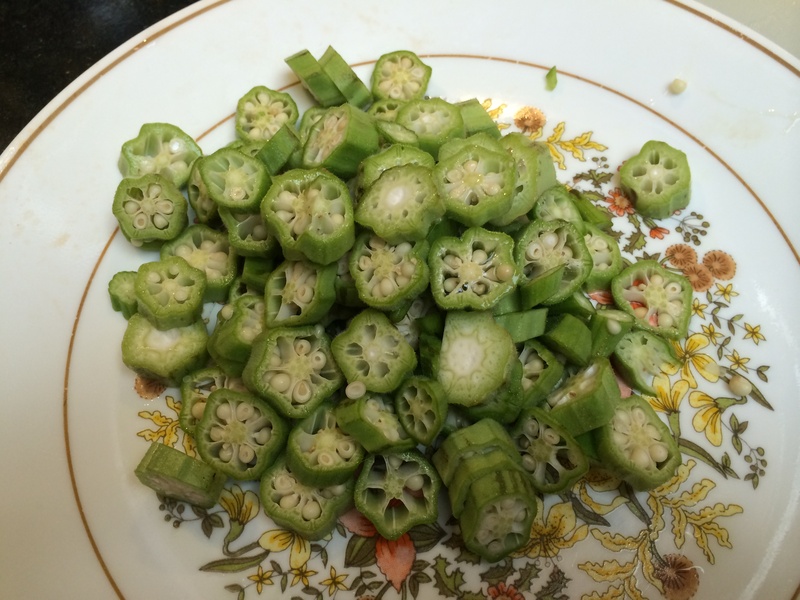 Hello, okra. And rice has become the traditional accompaniment to gumbo; there are other rice-based dishes in Cajun cuisine as well (like jambalaya). Now a lot of veteran gumbo-eaters will probably click away as soon as they hear the word ‘vegetarian’ spoken before gumbo. But for the rest of you, here are three that I made. 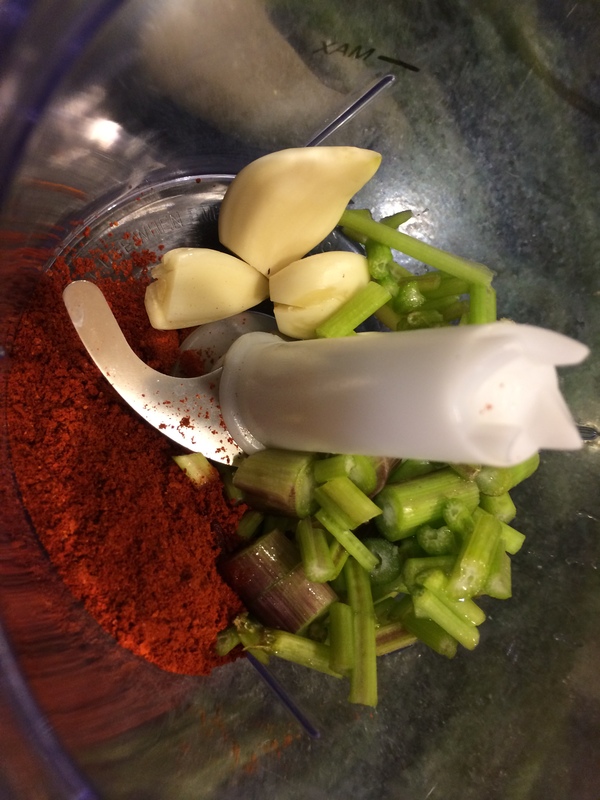 Since this was my first time making gumbo, I tried to keep it very simple, and not add too many flavorings; at the risk of sacrificing flavor, perhaps, but all the better to learn the basic palate of these few key ingredients. I also used whole wheat instead of white flour, because I am a bit of a fanatic. The only difference it made is that I believe the final result was a bit grittier than it would be with white flour. The amounts specified here can form up to four separate gumbo meals for two. 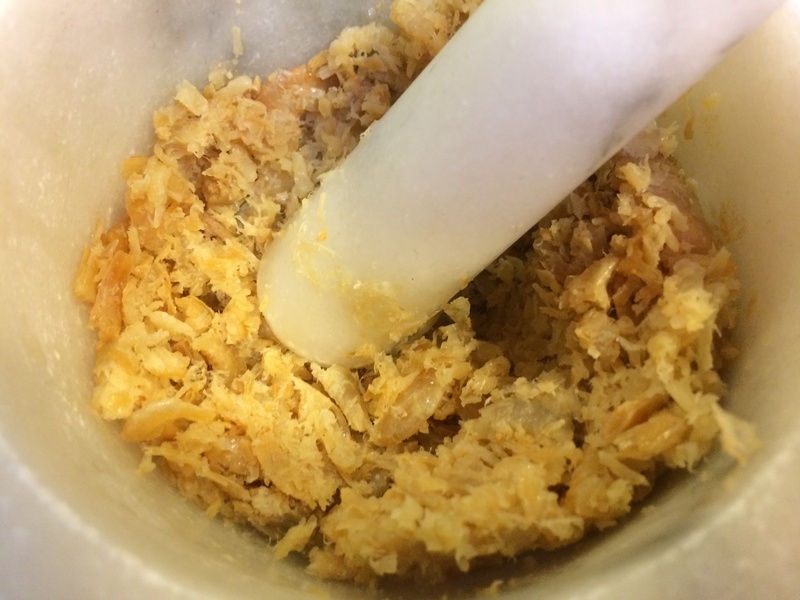 Heat the fat in a thick-bottomed pot and when it melts, put in the flour. 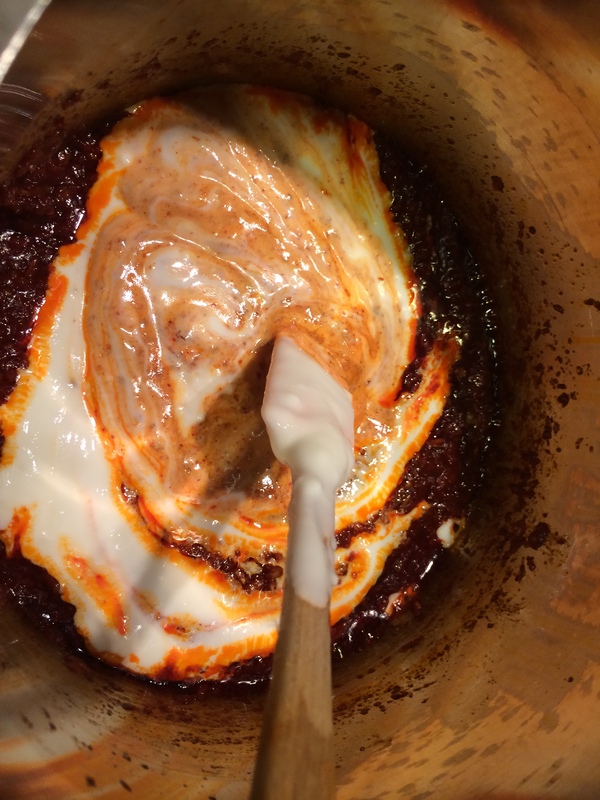 Stir to combine into a paste. There, the roux is underway. Now the idea is that it has to go from a blond color to a dark chocolate brown. For me, this took about two hours, because I had the heat on medium to medium-low, which made it so that I could stir it every minute or so. If you are willing to stir it every ten seconds or so, you can have the heat higher and it will be done faster. So in about two hours I went from this to this. Remember I started with whole wheat flour so it was already brownish from the beginning. 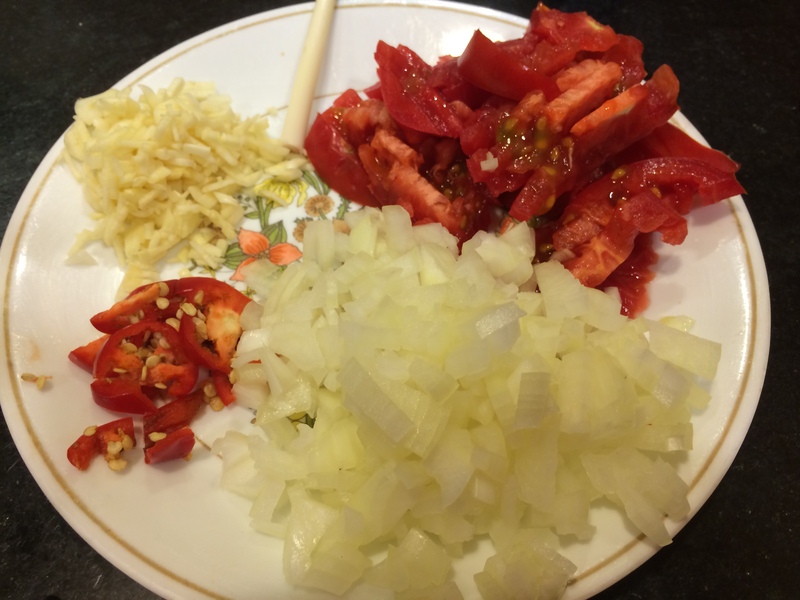 Now chop up the vegetables into little dice and put it into the pot along with the salt. 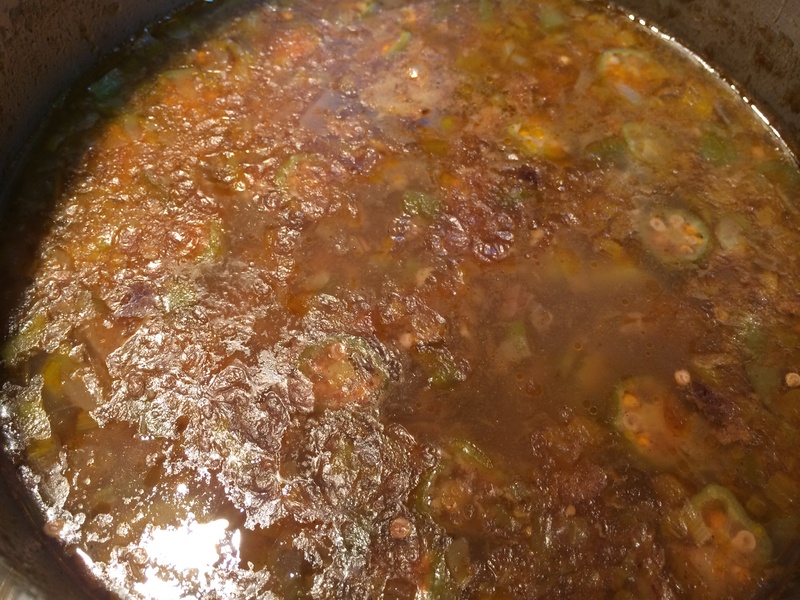 Even if the roux had been calmly cooking away, you will notice that upon entry the vegetables will immediately sizzle, showing how hot the fat really is. 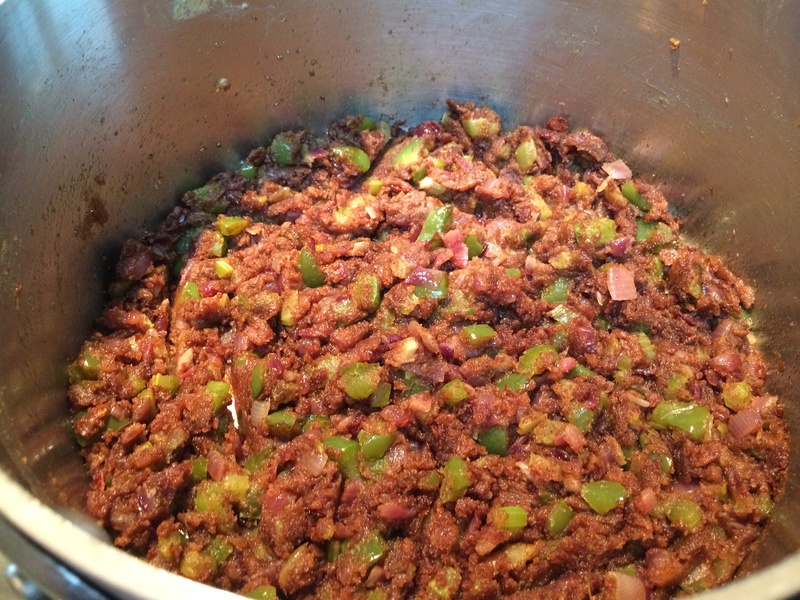 In about 20 minutes of cooking, the vegetables soften down and the gumbo base is done. 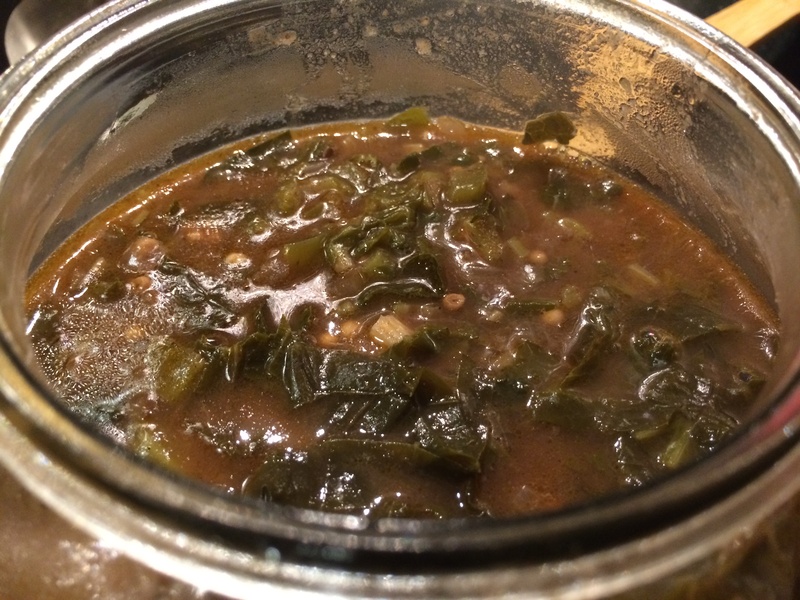 I divided the gumbo base into 4 quarters to store. 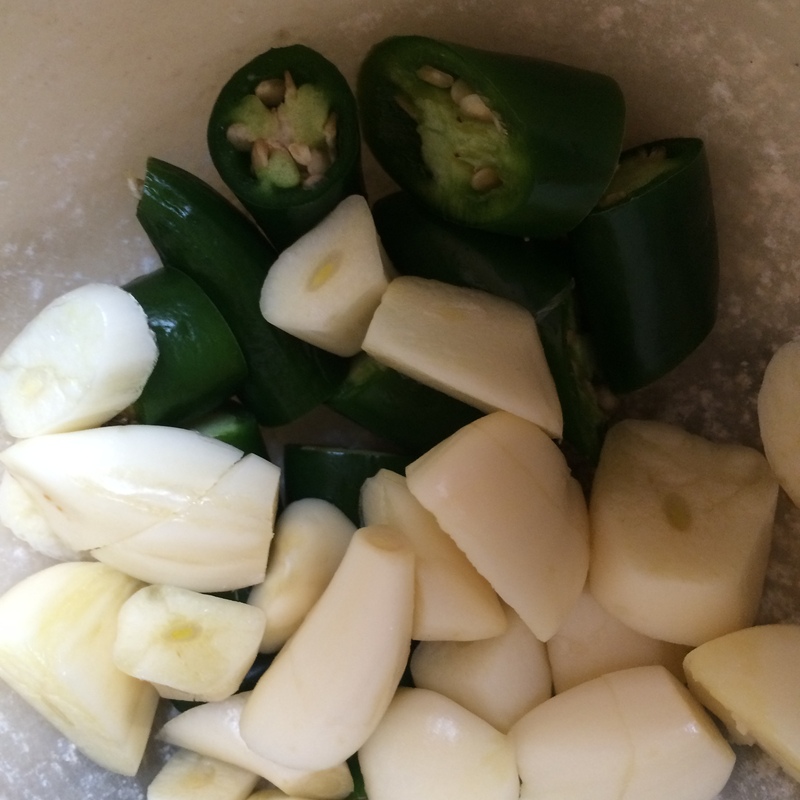 Each quarter can be used to make an entire gumbo meal for two people. 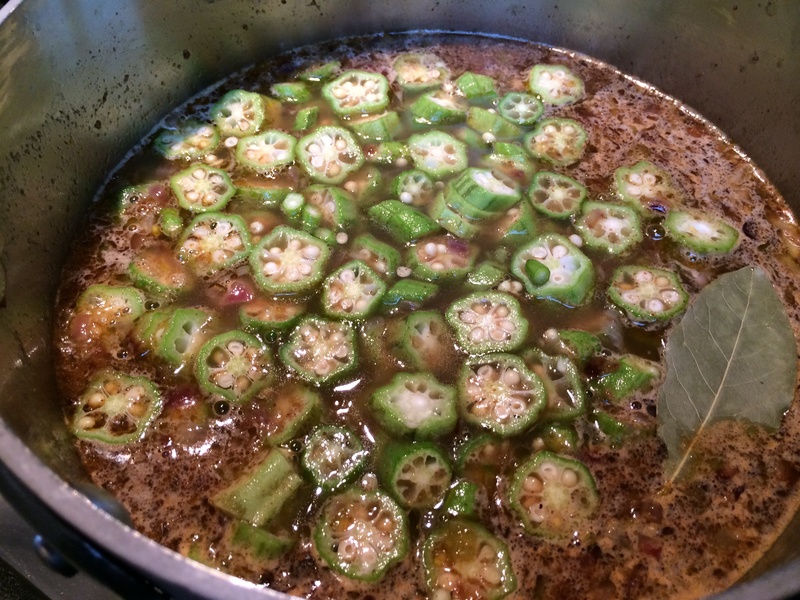 Each quarter will take about 2-3 cups of additional liquid (water, stock, milk); so using that hint you can make any gumbo dish. 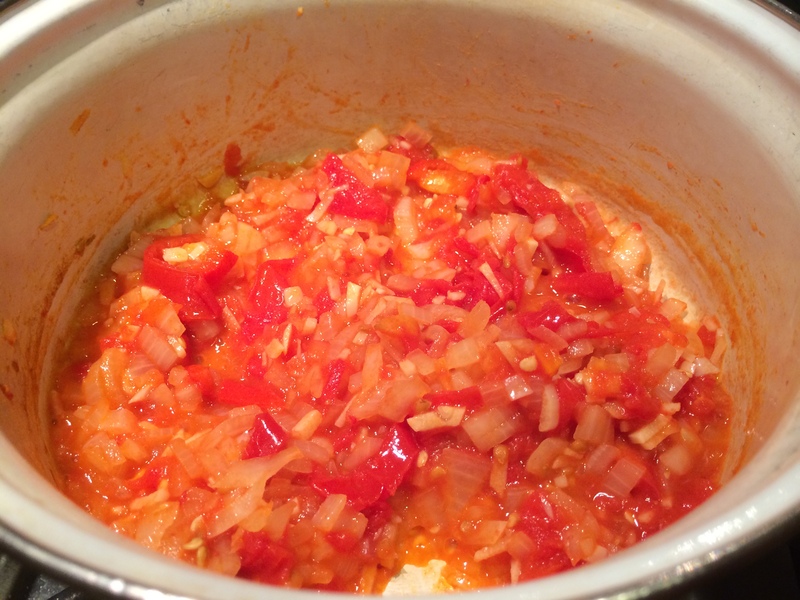 The resulting meal, once the base is done, is very quick and can be easily put together on a weeknight. 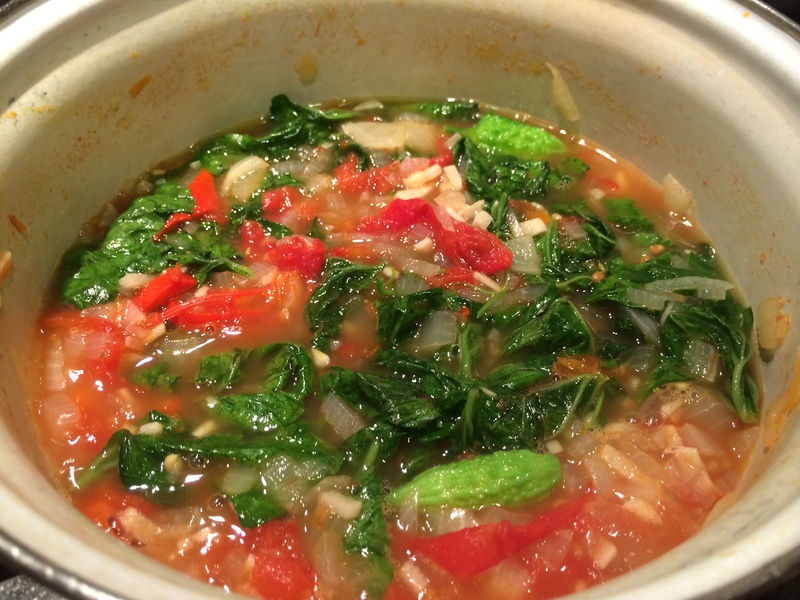 In this gumbo, okra is cooked into the stew and greens are added later. I love the earthiness that okra adds here. Instead of pureeing the greens as is often done, I left them in ribbons, and enjoyed that textural variation. 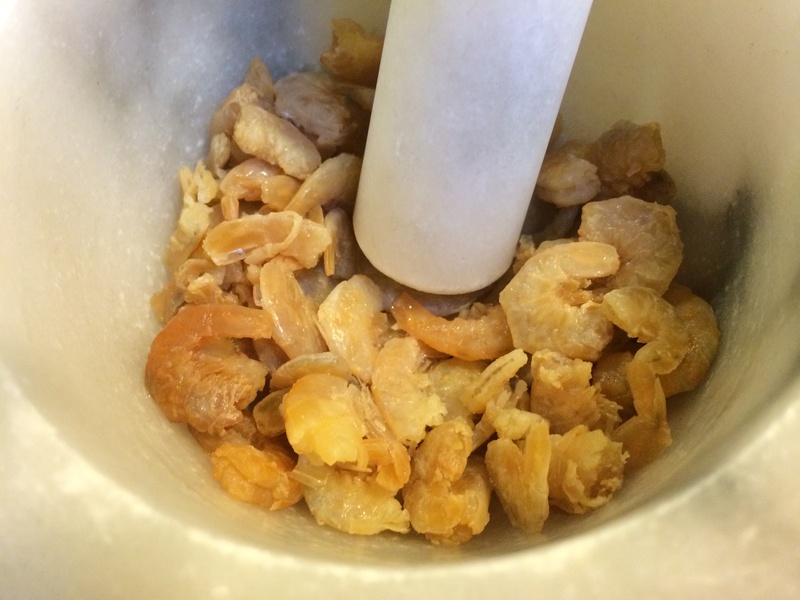 A little vinegar is added at the end for some brightness. Heat the gumbo base in a pot. 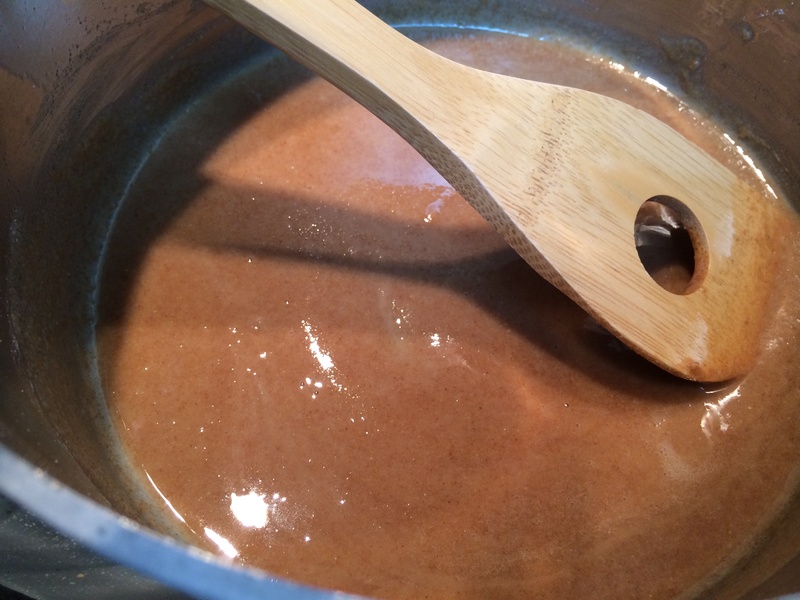 Once it is hot, add about 5 cups of hot water, little at a time, after each time stirring the roux into a paste. This is the classic French method of making béchamel sauce, except that the liquid in that case is milk. 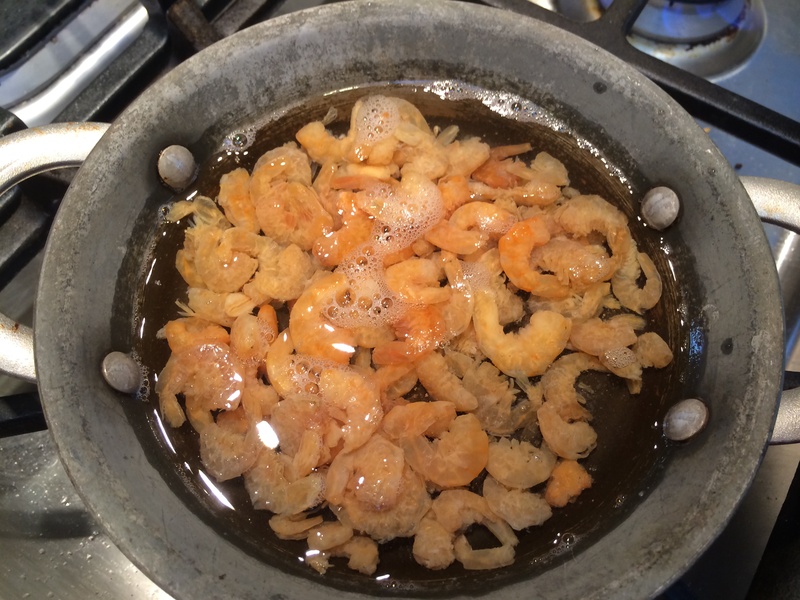 Once all the water has been incorporated — this will take a few minutes — bring to a low boil. 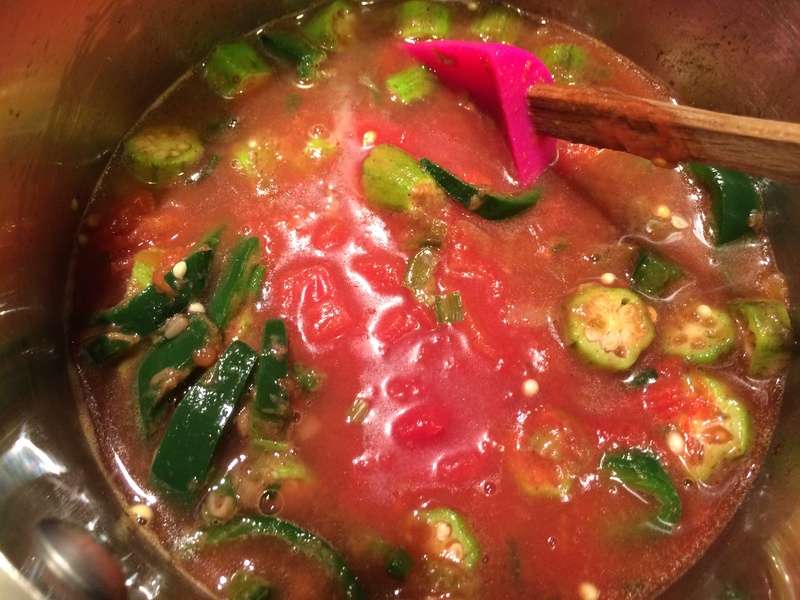 Add the okra, the paprika, bay leaf and salt. Boil for half hour to one hour on a low boil. Now add the greens. They only need to cook for ten minutes or so. Add the vinegar, taste for salt, and you are done. 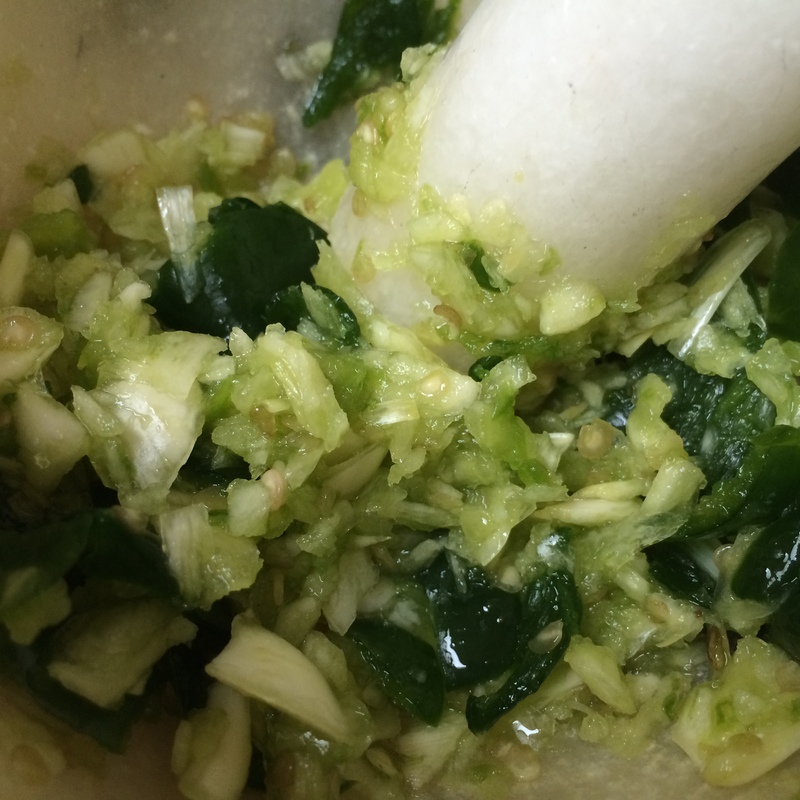 Cabbage is found as an ingredient in some older recipes from the region and has lately gone out of style…why? Because — cabbage! Come on! Well I’m pretty déclassé myself so this recipe definitely attracts me. Milk is used as the liquid this time. Also this time I used filé powder at the time of serving; it thickens and adds a herbal something. 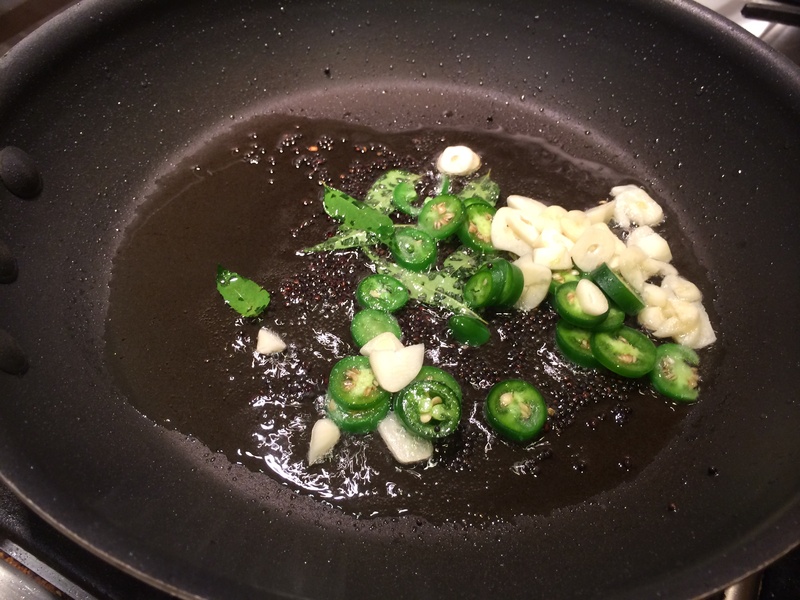 Heat the gumbo base in a pot along with the serrano chili, sliced. Put in the milk in the style of béchamel sauce, stirring to combine into a paste each time, making sure that there are no lumps. Once all the milk has been added, bring to a low boil. Add the cabbage and salt. Let it cook until the cabbage is softened, about 20 minutes. Serve with rice and some filé powder, which is to be stirred in. Most of you won’t care one whit but I guess I am dipping my toe into controversy. Some people don’t consider that tomatoes belong in a gumbo at all, but then I find tons of tomato gumbo recipes on the interwebs. So here it is, for what it is worth. Authentic or not, it was delicious. 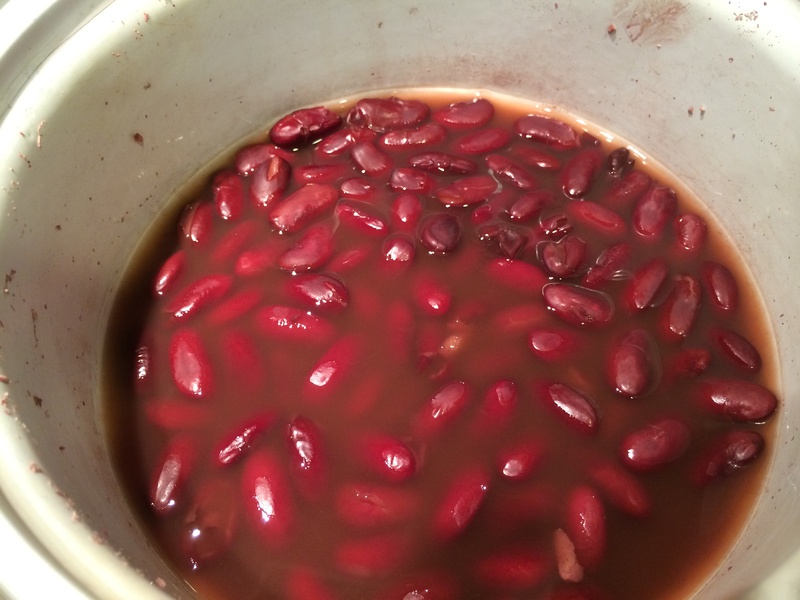 Soak the red kidney beans overnight, or, in very hot water for an hour. 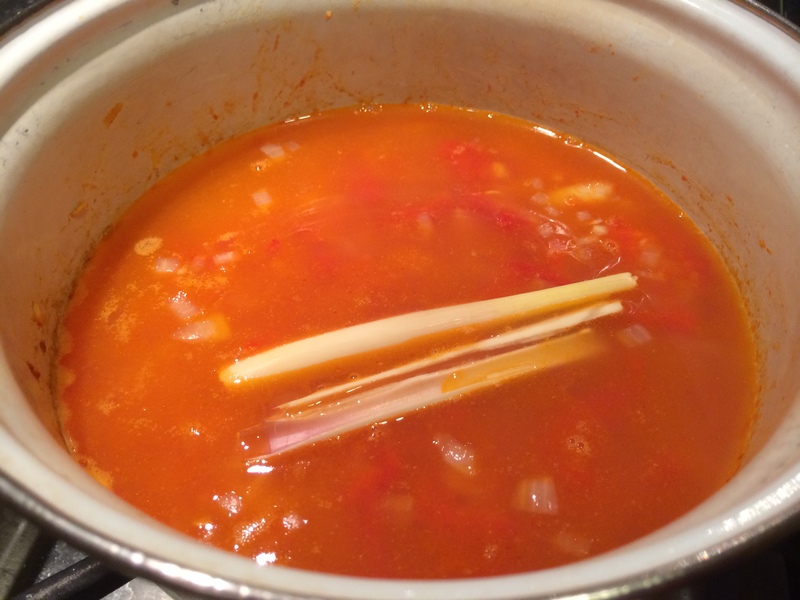 Then put them in a pot with about a cup of water, bring to a boil, cover and simmer for half hour or so till softened. Put the gumbo base in a pot on medium heat. 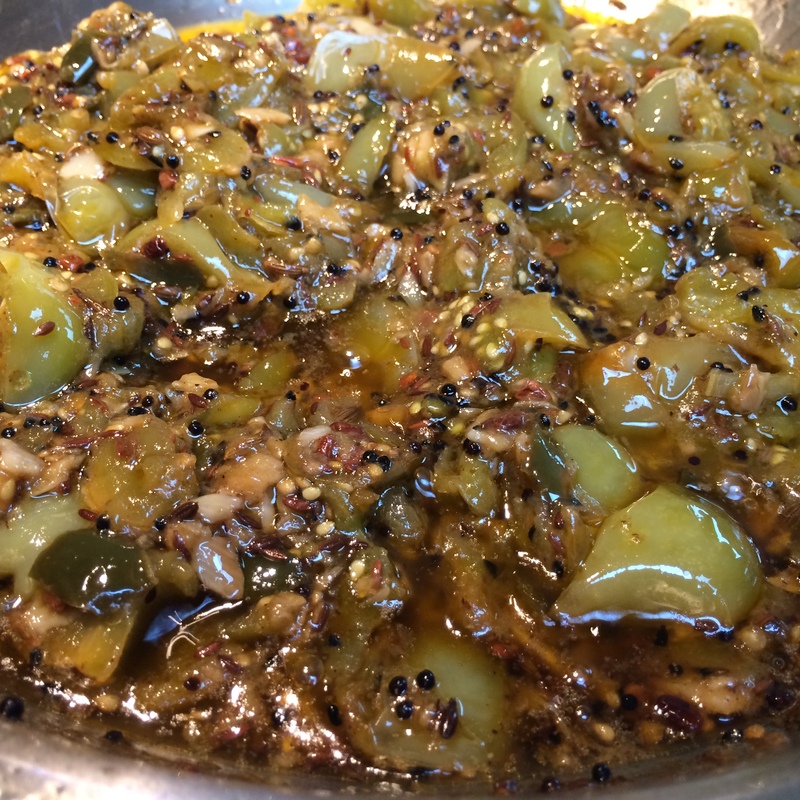 Once it is hot, sweat the three vegetables in it, one by one: first the garlic for a few minutes, then the pasilla peppers, and then the okra. 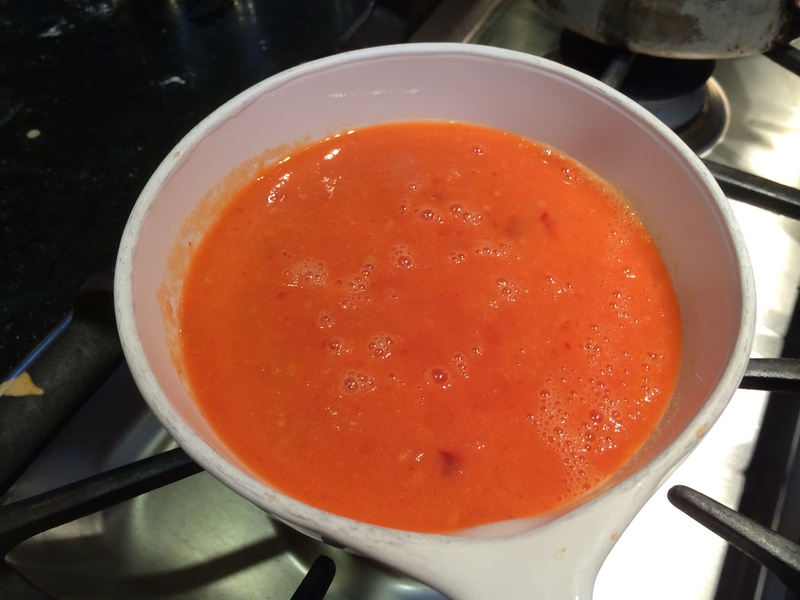 Now in goes the tomato purée along with a cup and a half of extra water. If you had any water left over from cooking the beans, now is the time to add it. Add the salt. Bring to a boil, leave at a simmer for at least half hour, or as long as you want, until the vegetables are as softened as you like. 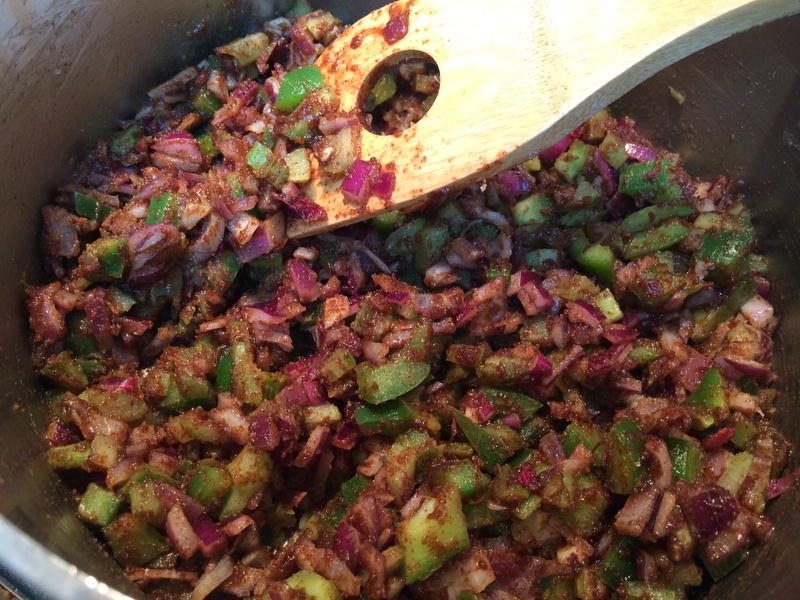 In the last ten minutes of cooking, put in the kidney beans to meld its flavors together. 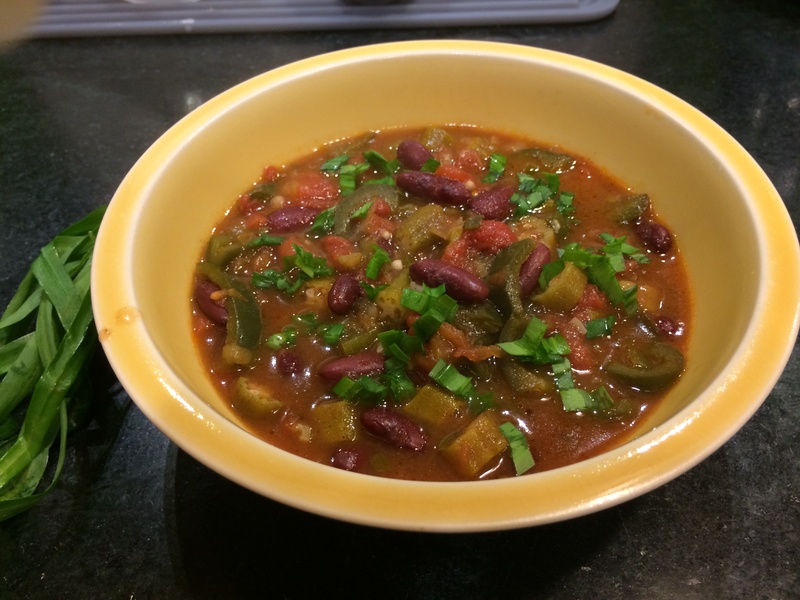 So what did my adventure with vegetarian gumbo teach me? It can be done with excellent results. 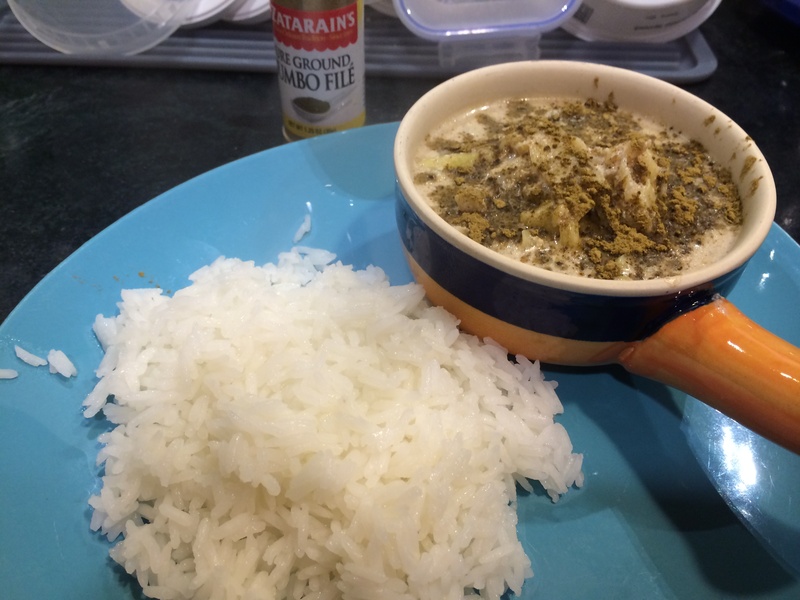 My husband enjoyed all three gumbo meals; he never once asked ‘where’s the meat?’ But he is so spoiled with Indian food that he did ask — ‘where’s the masala?’ I guess that is a compliment? I referred to several webby recipes for Gumbo. Here are some of them. Of course, the lard makes it not be vegetarian! Please use ghee for a ‘pure’ vegetarian experience. Or a good oil with a high smoke point. 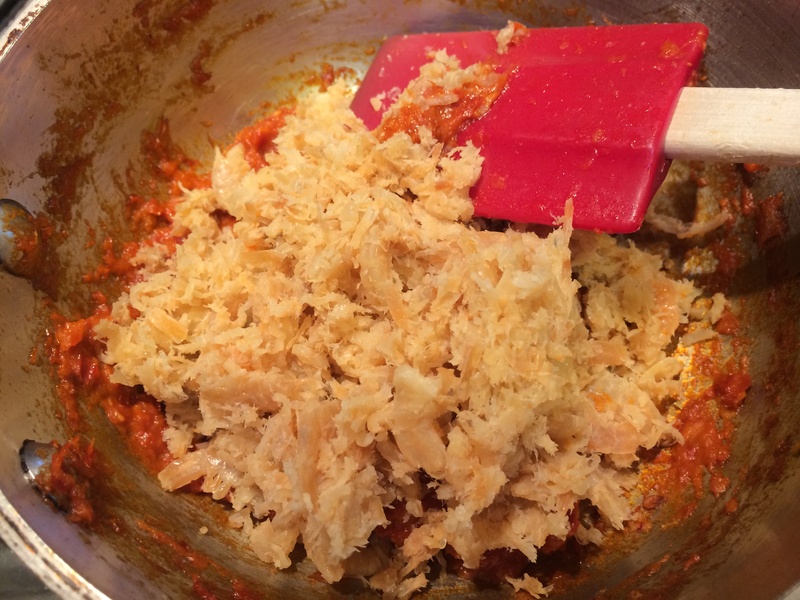 I used lard because I had some in the freezer, but then I’m not big on purity (of any sort!) I just like the taste of vegetables and am not keen on the taste of meat. There there, I know what ails you. 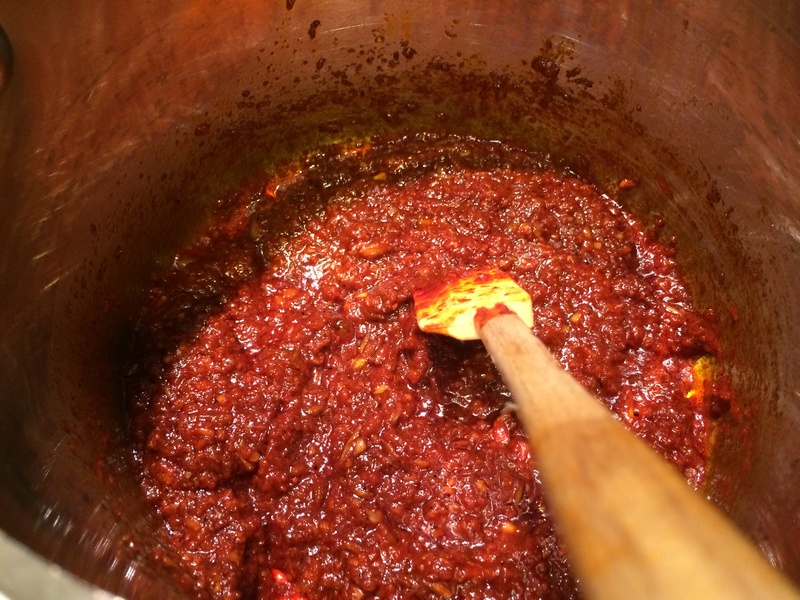 You love the smoky flavor of dried red chilies, but their heat makes you run for the jug of water. It may also give you the runs. You curse the American continent for inventing these pods of TNT. You wish that you could turn into a bird, not so that you could then fly, oh so free! — but because then you would lack the pain receptors for capsaicin that you share with other mammals. Don’t worry, I understand! You can cry on the shoulders of Aunt Odd Pantry. And still, the flavor of chilies haunts you! How to get one without the other? There is a way! You see, just like some countries invest heavily in defense (like my home, the United States), while others have to expend so much energy to just survive in the desert that they don’t have much left over for defense (like Dubai in the UAE), chilies come in two styles as well. 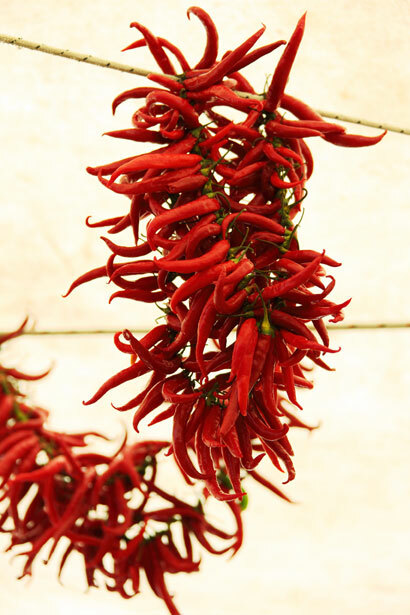 Chilies that grow in wetter climates, where their sworn enemy (the fungus Fusarium semitectum) grows easily, invest a lot in defense and become hotter. 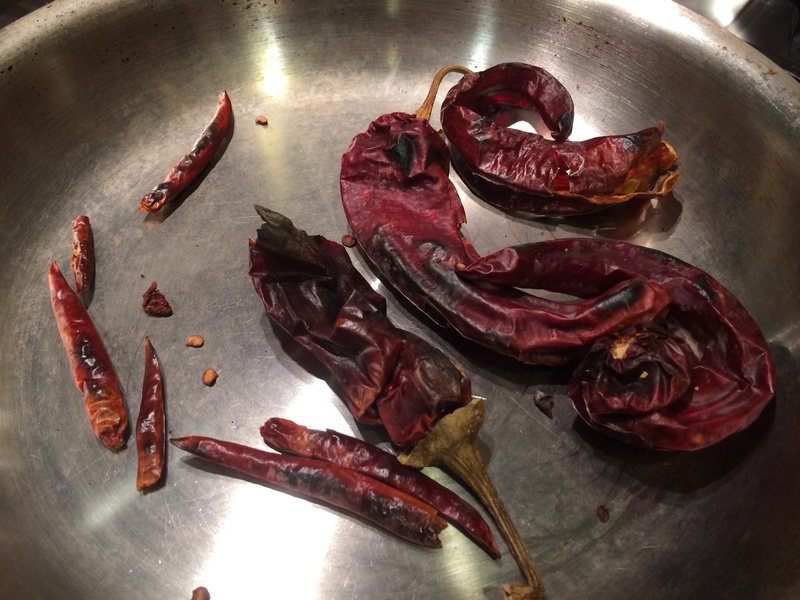 While chilies that grow in drought conditions have to be more judicious in how much heat they develop. The arch enemy — the fungus — is less of a problem in drought anyway, because it needs wetness too. The hottest chilies in the world are the bhoot jholokia from Nagaland, India and the Trinidad Moruga Scorpion — both come from very wet climates. 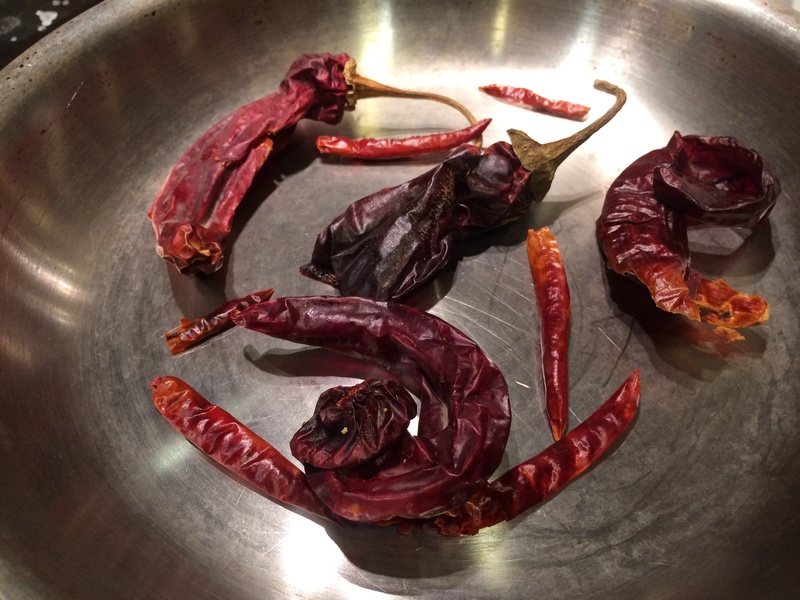 But then there is the panoply of larger, not-hot chili peppers — the pasilla, the Kashmiri, the ancho — that can be added to the mix to add flavor and color but not the heat. They thought of everything. 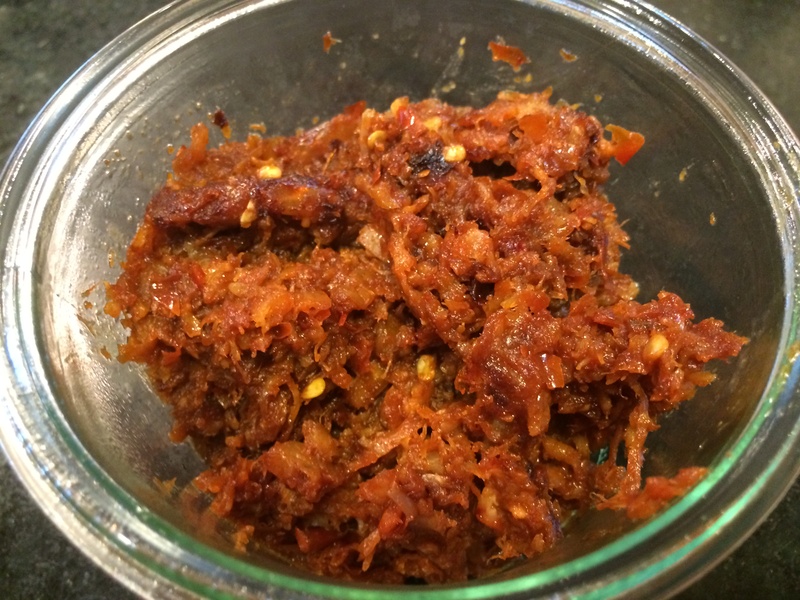 This dish in particular is based around that smoky flavor of chilies. 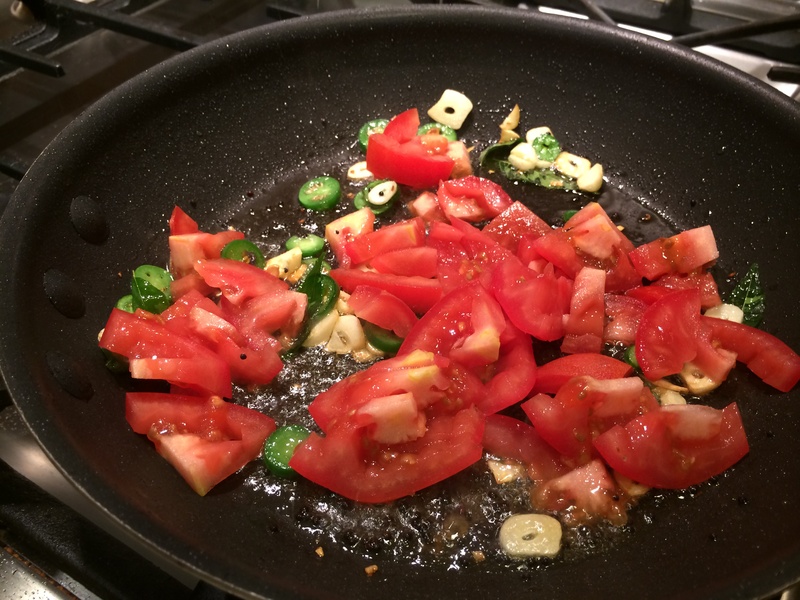 Tomatoes and garlic play a supporting role. Yogurt is used to moderate the taste further. 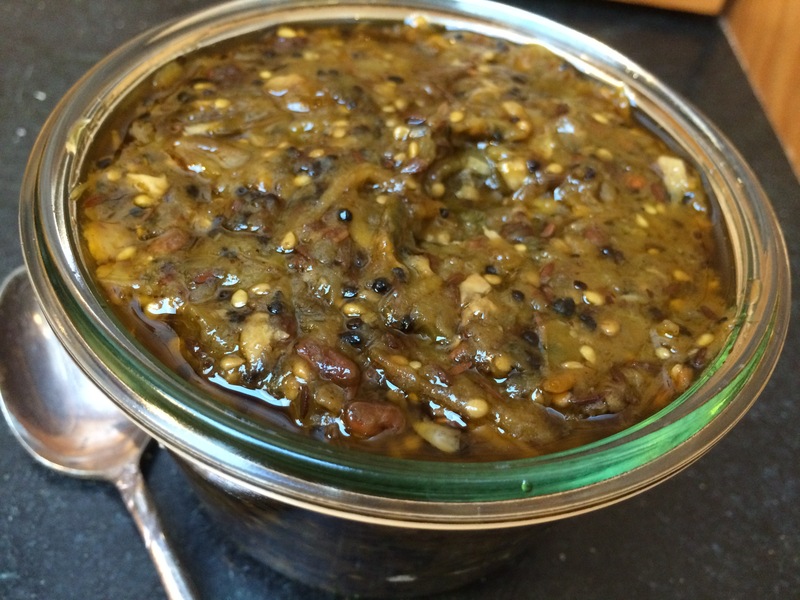 Like several of my other recipes, this is a gravy that one can throw anything into. 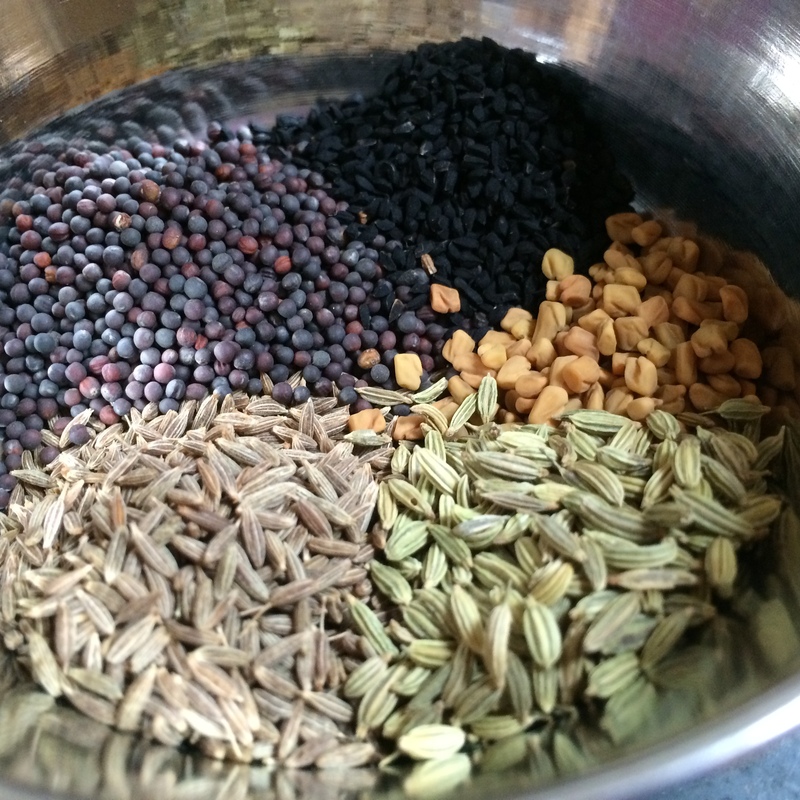 It goes very well over rice, or with chapatis, or dosas, for that matter. The recipe below makes enough for about 6 people. This proportion of mild to hot chilies gave me a pretty hot gravy. Feel free to use a different proportion, from no hot chilies at all to all hot chilies. You better know what you are doing if you choose the latter. 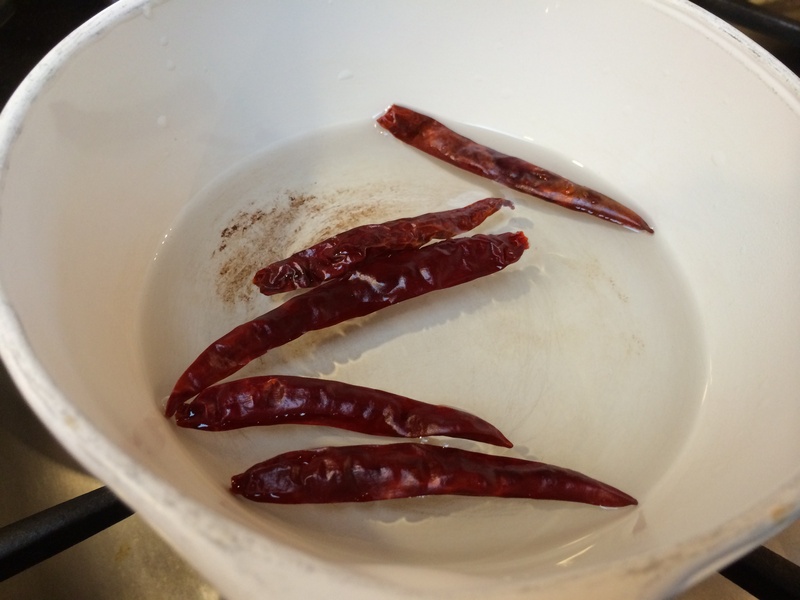 Heat a roasting pan on medium-high and place the dry chilies on it for a few minutes until they darken. Remove them to cool for a few minutes. When they are cool enough to handle, you can destem and deseed them. 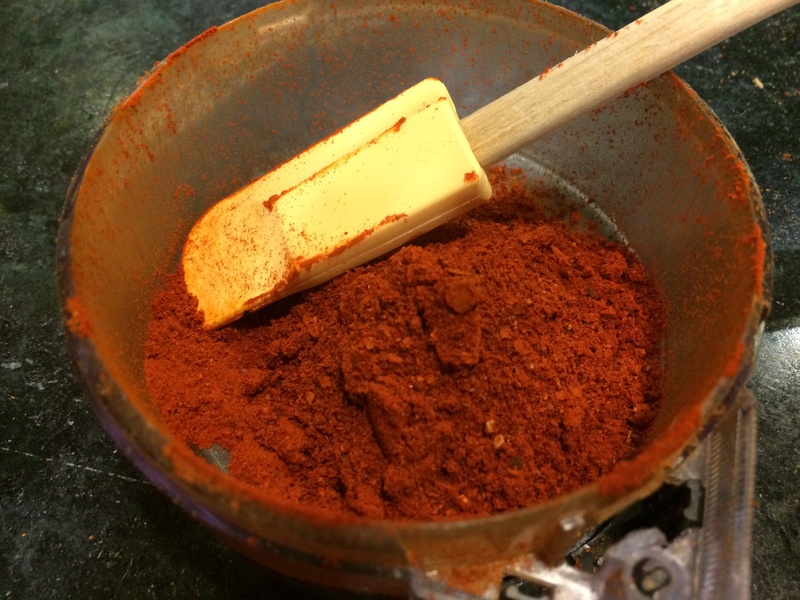 Grind them to a fine powder in a clean coffee grinder. 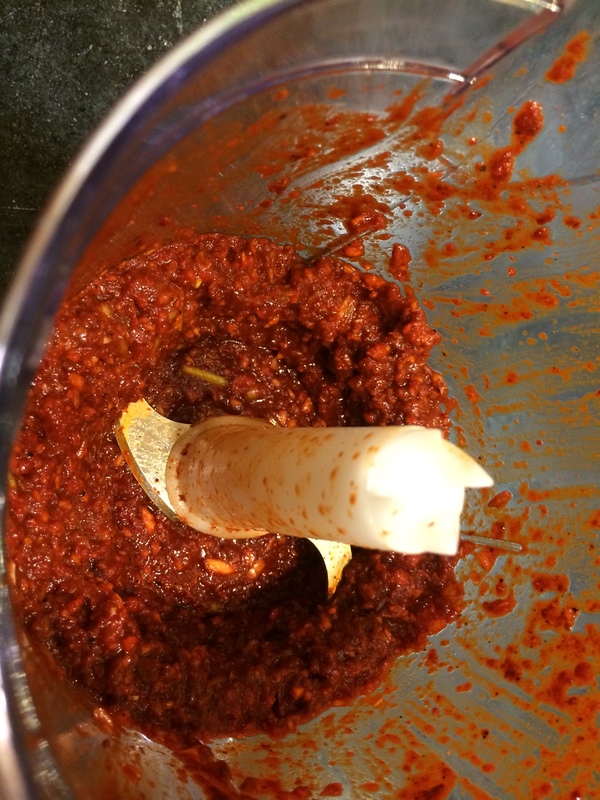 Make a paste of garlic, cilantro and chili powder, adding as little water as you can get away with. 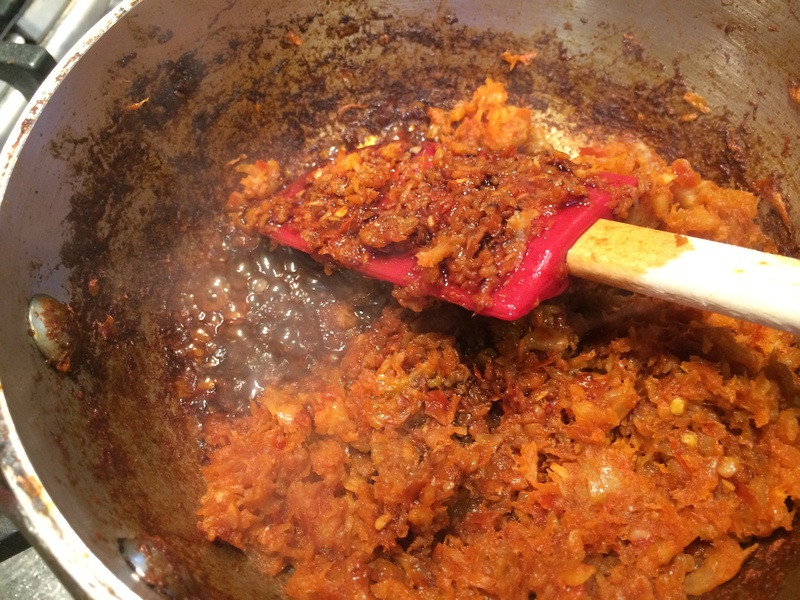 Heat the oil in a thick-bottomed pot. When it shimmers put in the paste. Stir and let it cook until it darkens, on medium heat. Soon you will see the oil shimmering and the paste will seem drier and yet shinier. Then you know it is done. Now whip up the yogurt and swirl it in. Stir and let that cook as well. In a few minutes, it will have properly merged with the paste and become homogeneous. 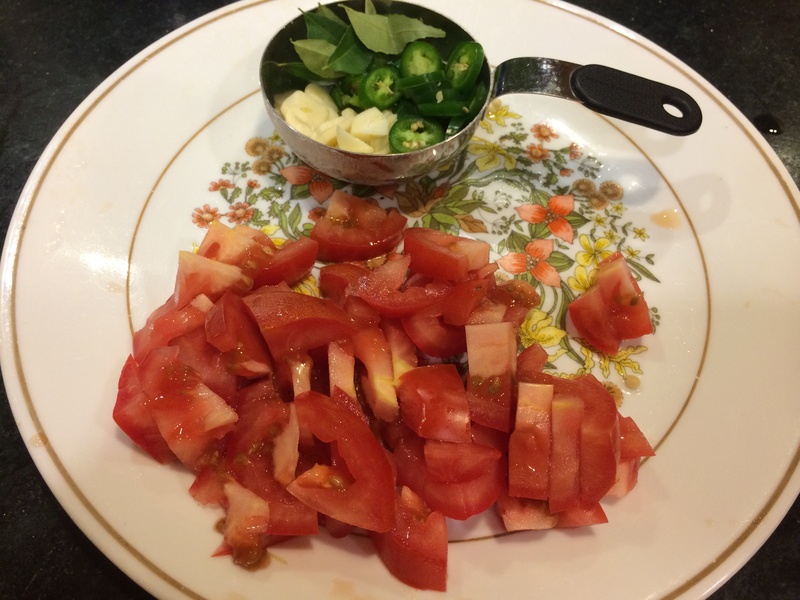 Now it is time to put in the roughly chopped tomatoes. At this point the paste is probably so liquid that you can raise the heat to highish. 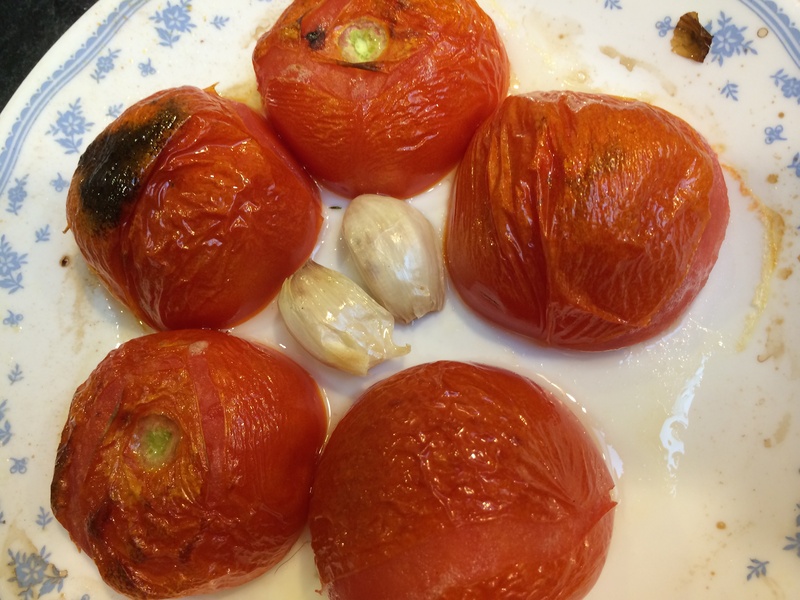 Let the tomatoes liquefy and boil off mostly. Add the turmeric and the salt. At this point, the basic gravy is done. 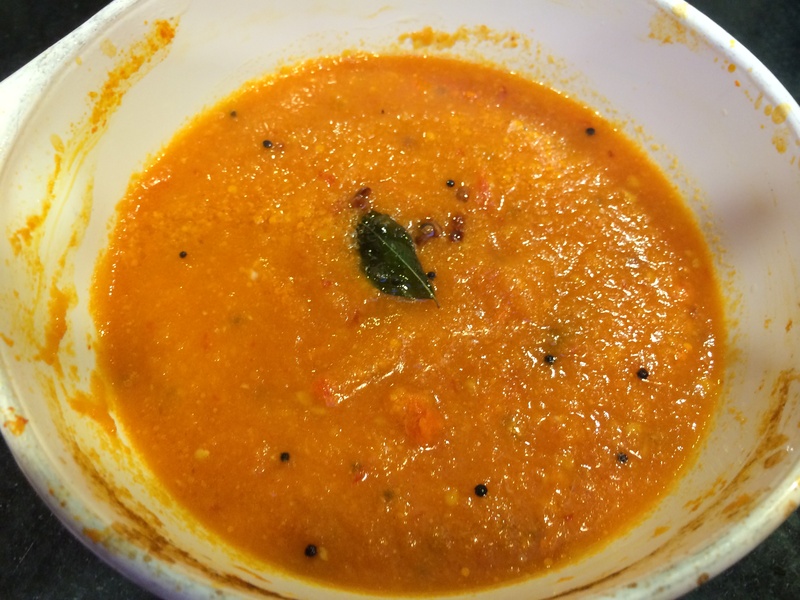 Add anywhere from a half cup to one-and-half cup of water to allow it to boil for a few minutes; also, by controlling the amount of water you are controlling what sort of dish you want it to be. If you plan to add some potatoes to it and have it over rice, for instance, you could make it more liquid, because potatoes will have their own thickening starch. 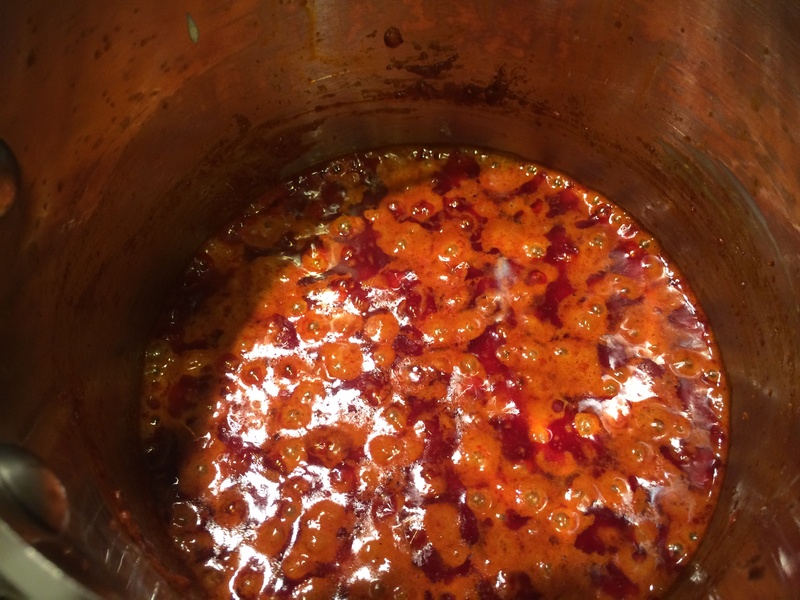 If you plan to add chicken bite-sized pieces, and want a drier sauce around it, you can skip the water entirely — the chicken will let out some of its own liquid. 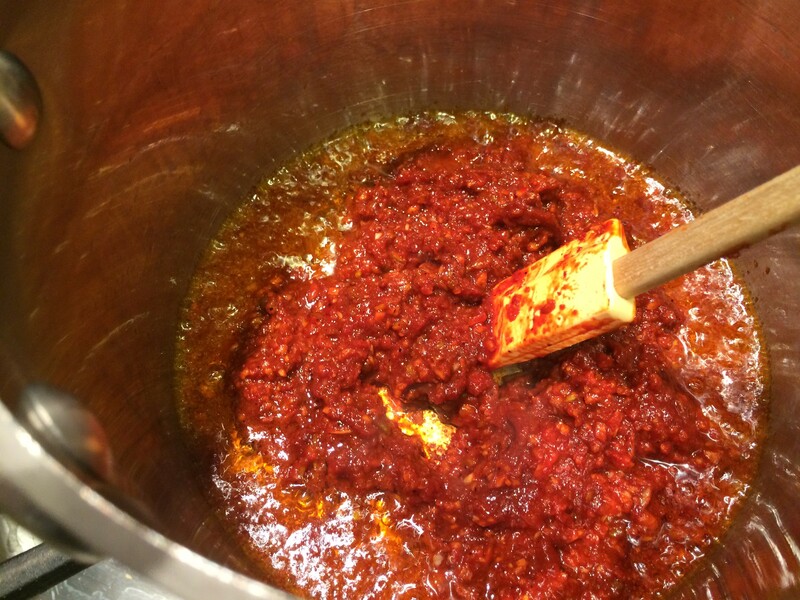 As you might have guessed, now is the time to make a dish out of it by adding whatever things you want to this sauce. Care must be taken to make sure that whatever you add will have similar cooking times. One trick is to precook the vegetables in a microwave and then add it in to blend. 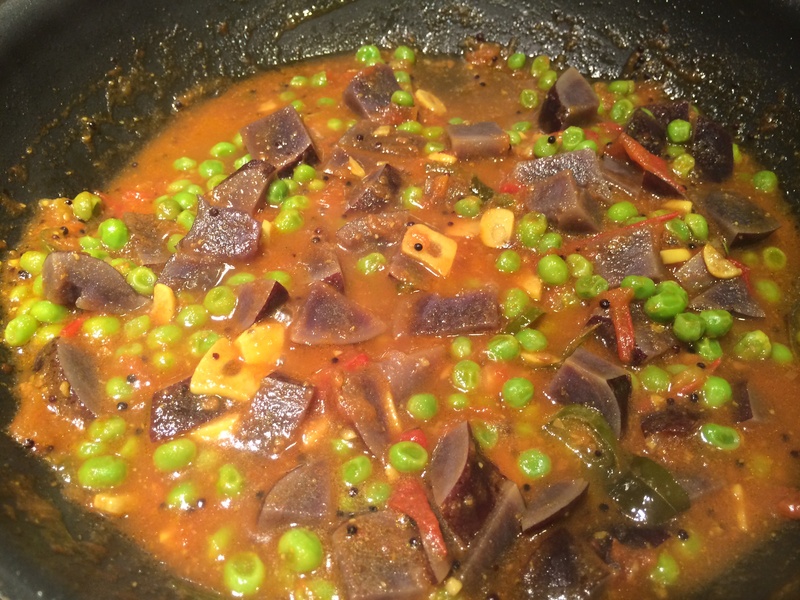 A combination of small cut up vegetables: carrots, peas, cauliflower, bell peppers, french beans, potatoes, raisins. 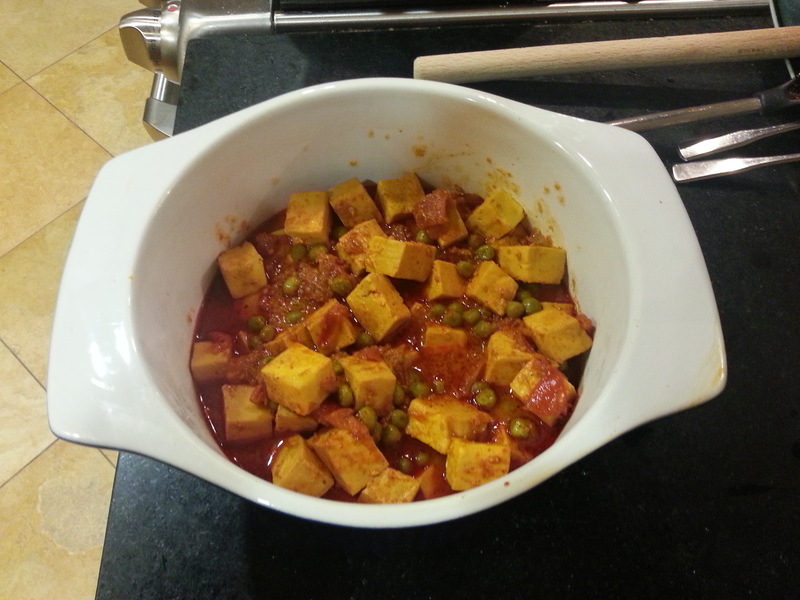 This is what I did with it — paneer and peas.